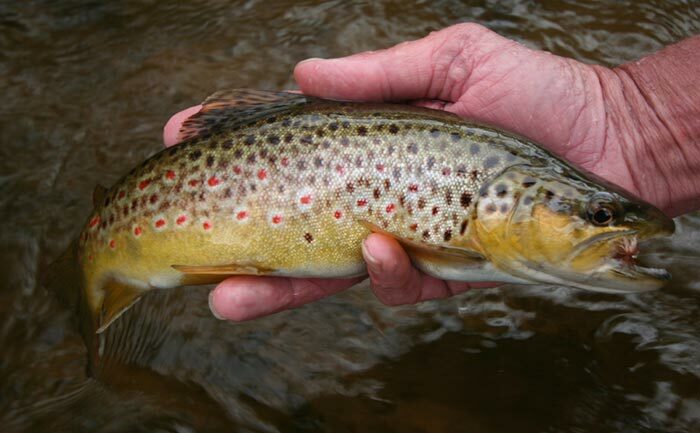 Some nice trout about. 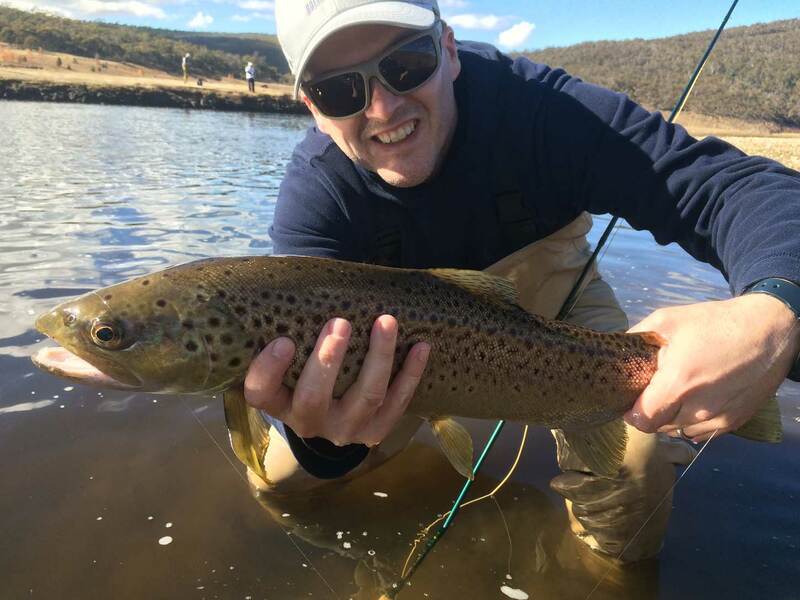 Great way to start the 2017/18 season. 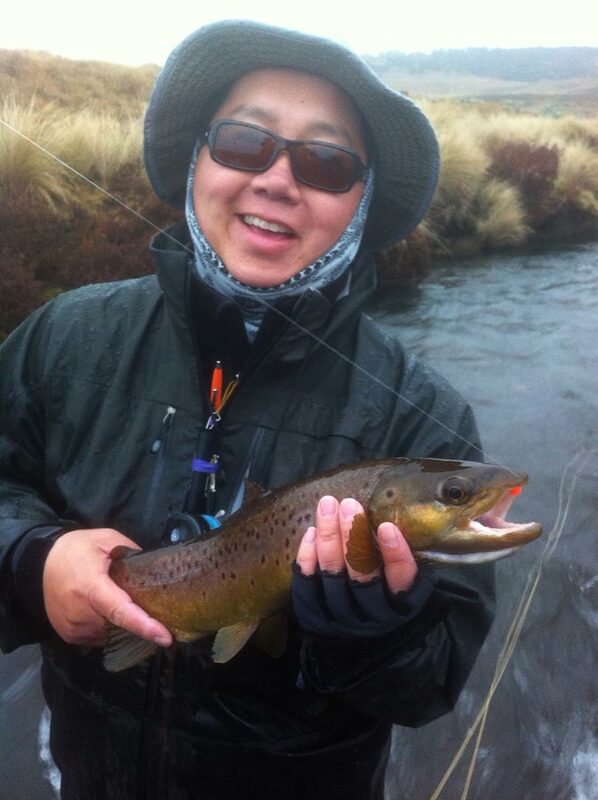 Kelly Smith with some nice late season Brownies. 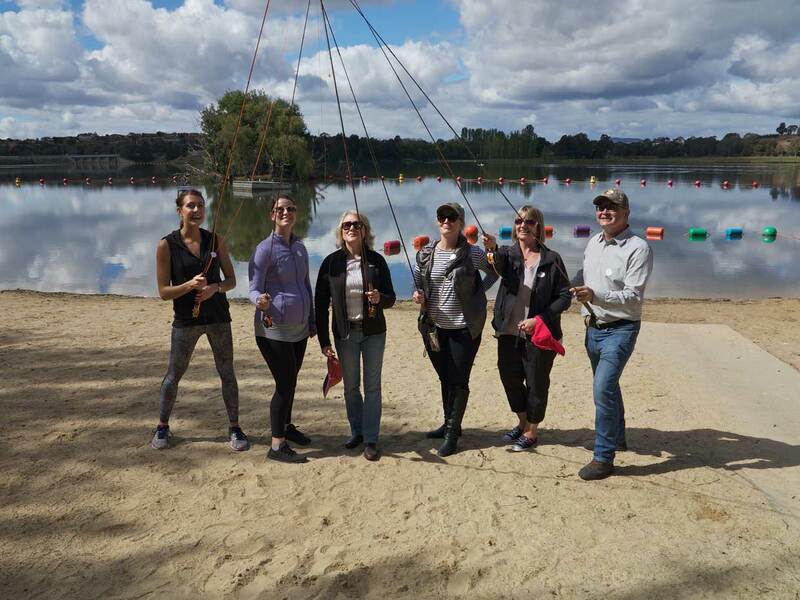 Dr Tonks and the team at Canberra Plastic Surgery having some fly casting fun. 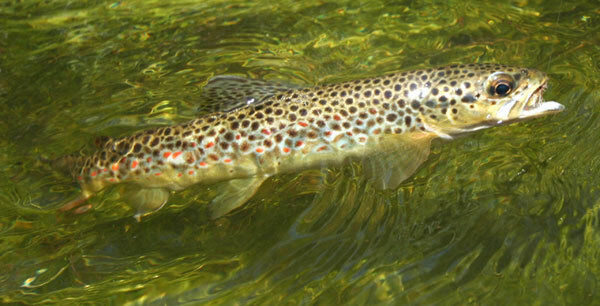 Some excellent fish on dry flies so far this season. 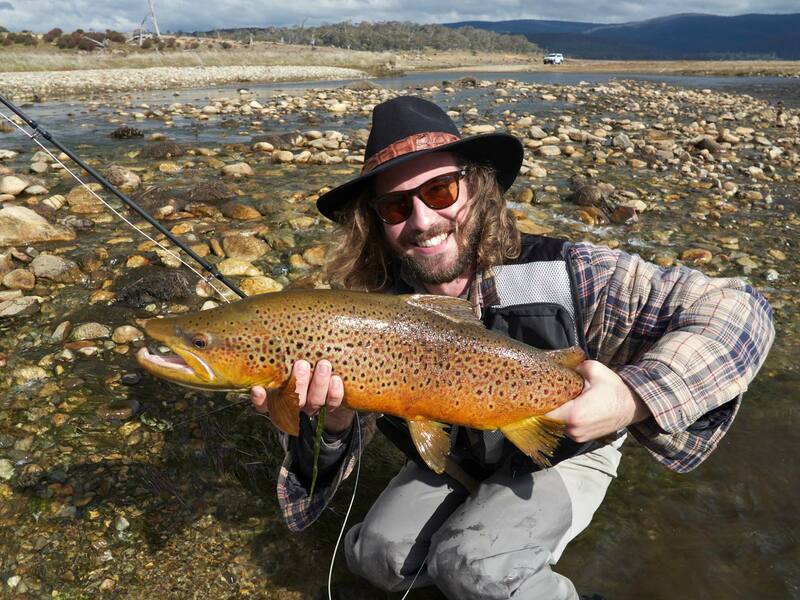 Wade having some fun on the run! 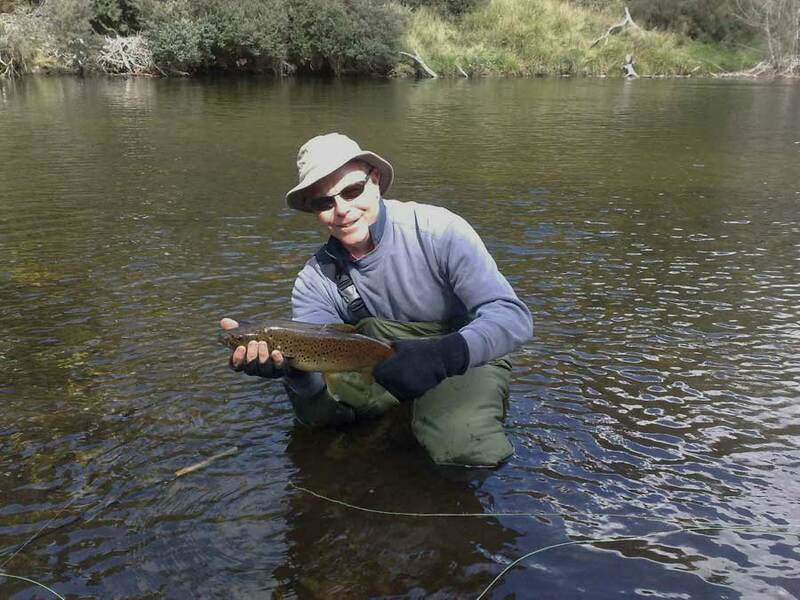 Garry enjoying dry fly fishing in the Snowies 11/15. 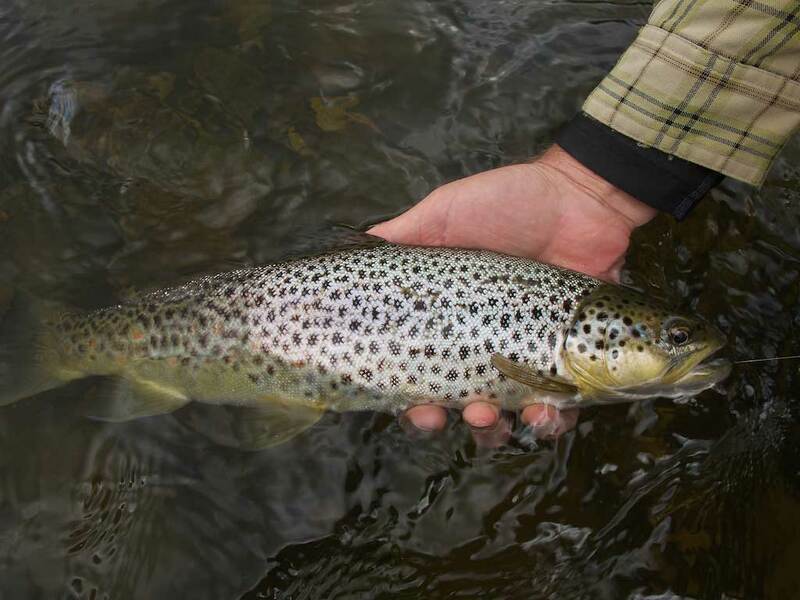 There have been some nice ones this season. 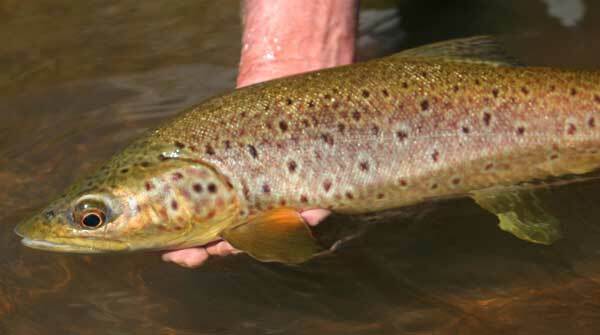 Season 2014/2015 opens with a few nice trout on dries for Nick Tarasky, me and an especially good one for Kel Macnab. 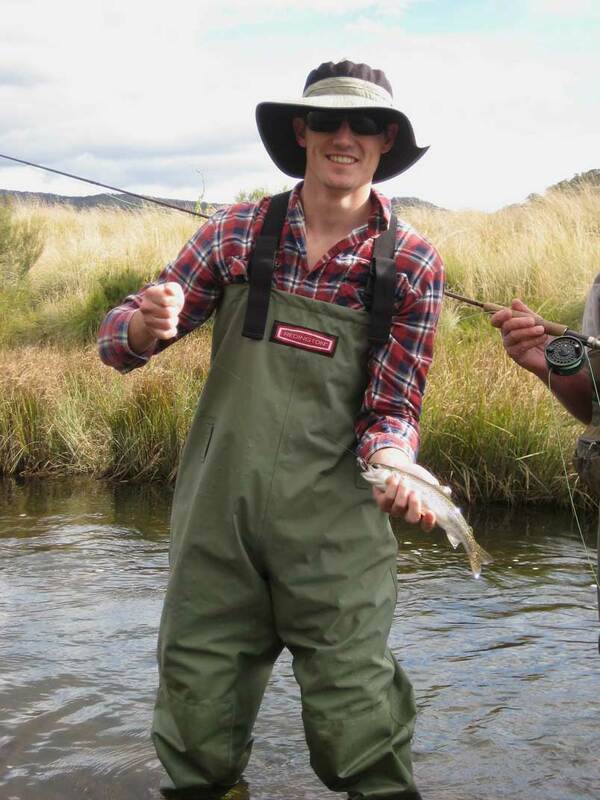 Nice trout! 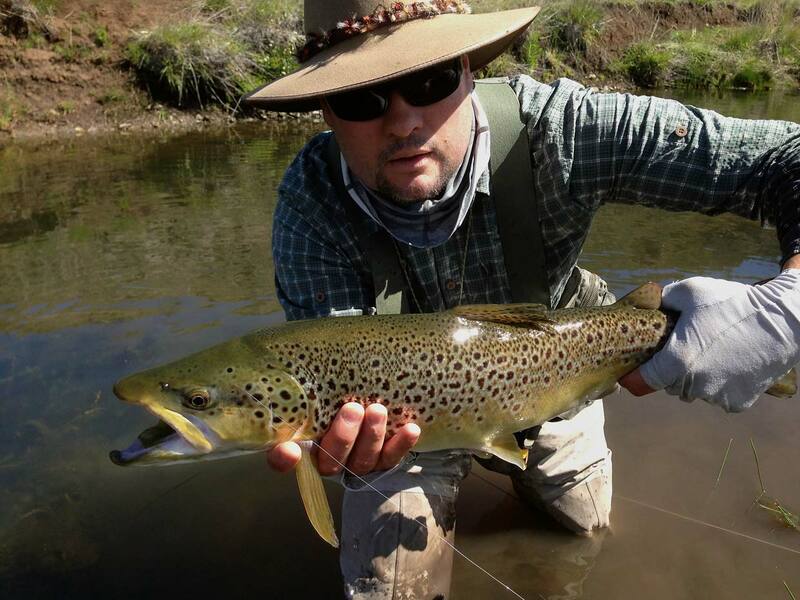 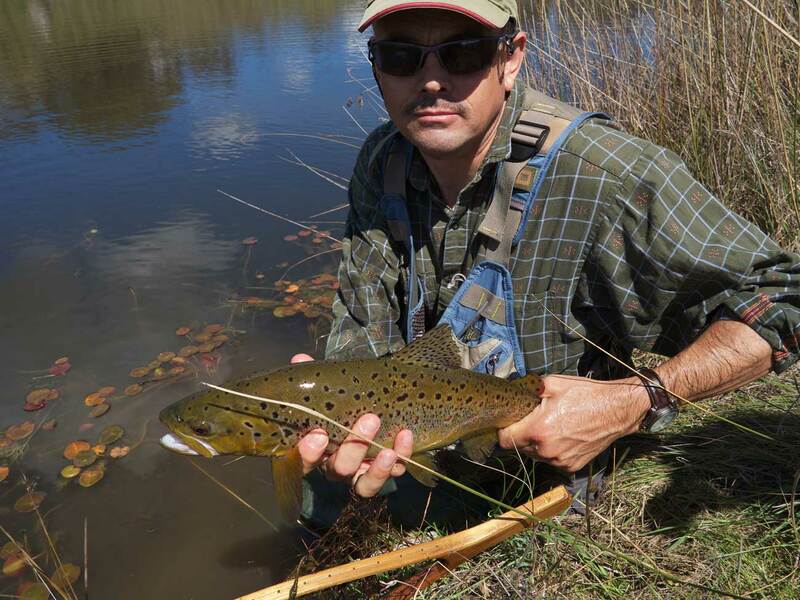 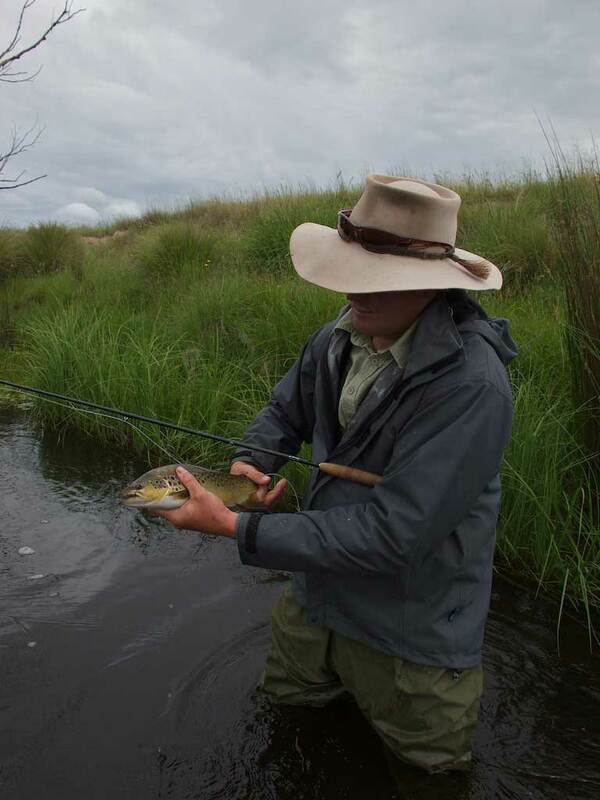 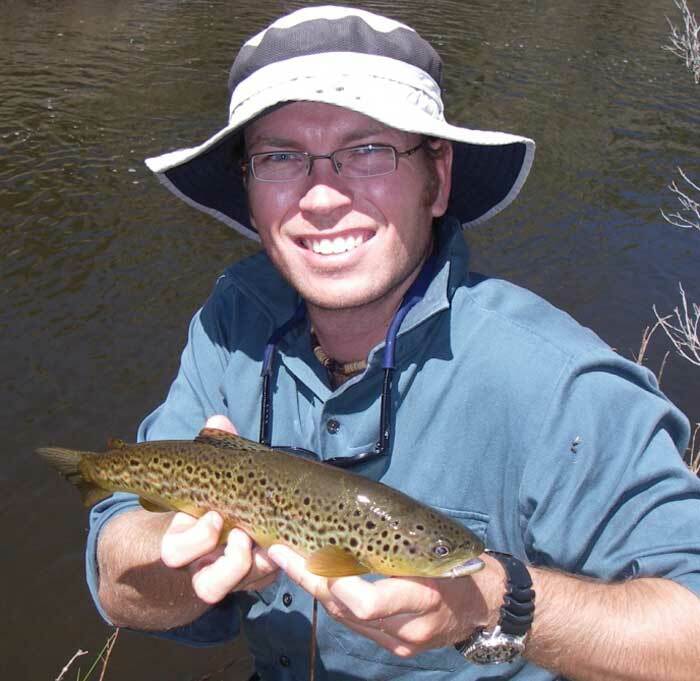 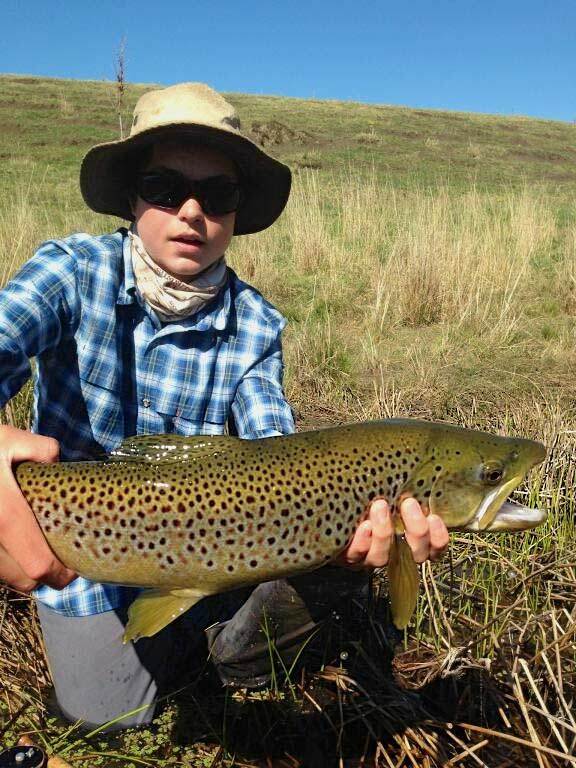 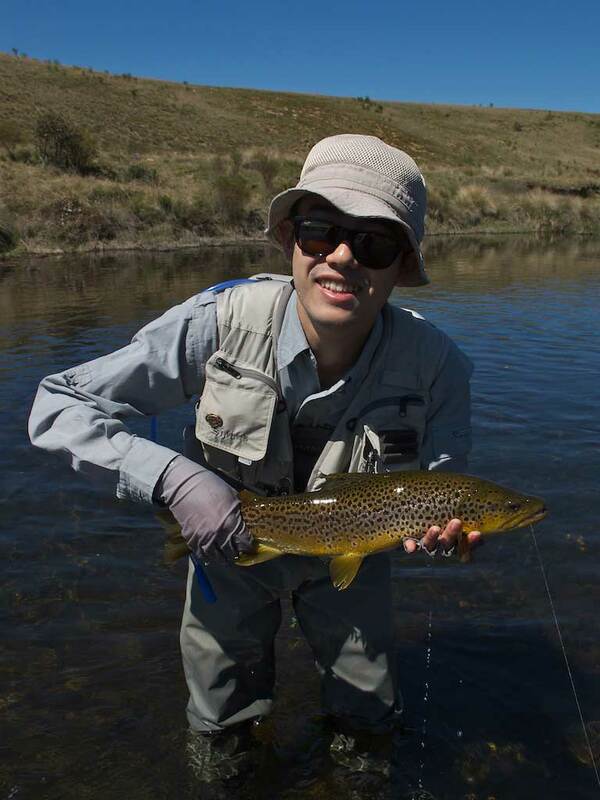 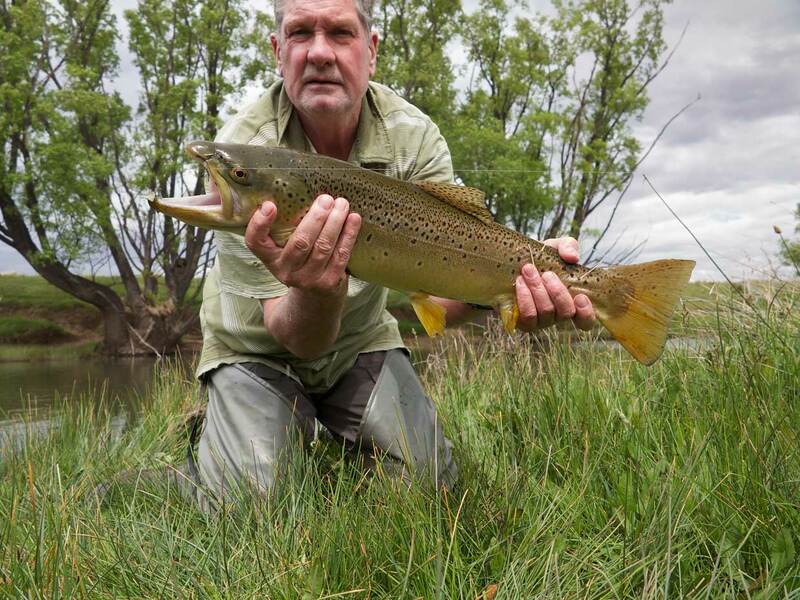 Local Monaro High school teacher Troy Macnab with a fine brown trout on the dry fly. 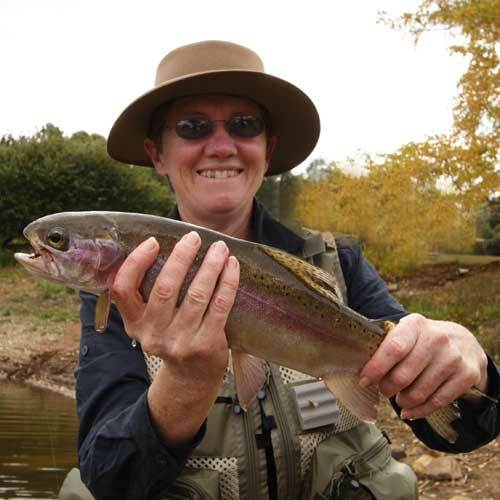 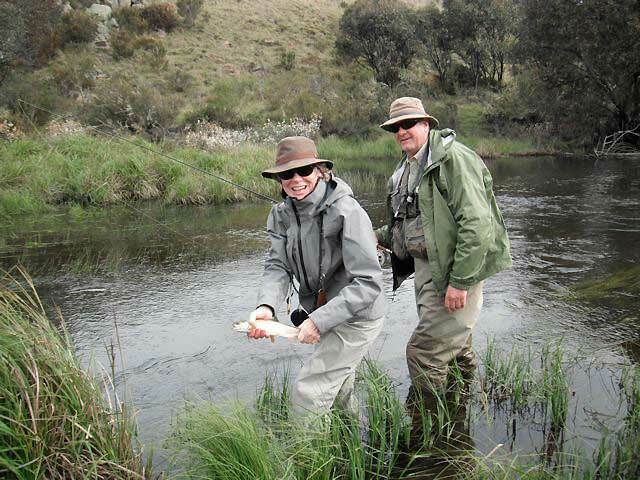 Michael and Sue enjoyed themselves fly fishing in the region while visiting from Albury. 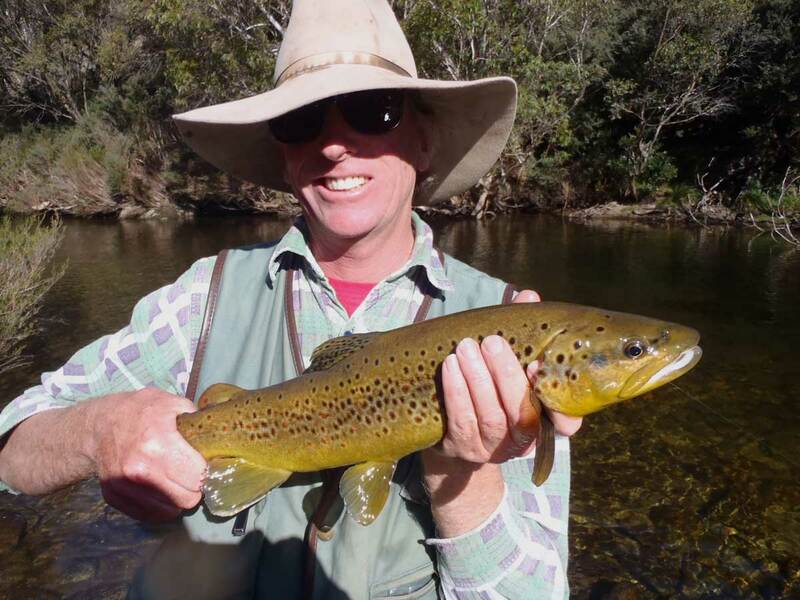 Some cool late season action for Andrew & Jim down from Queensland. 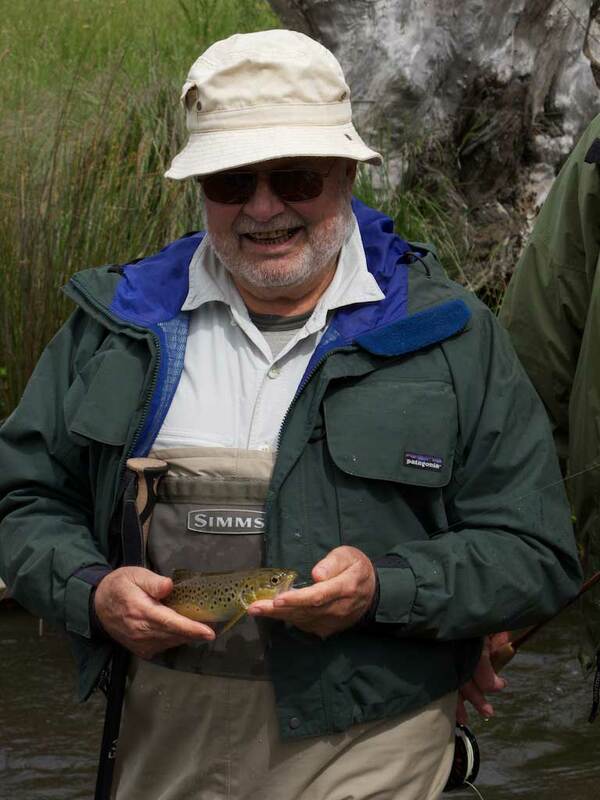 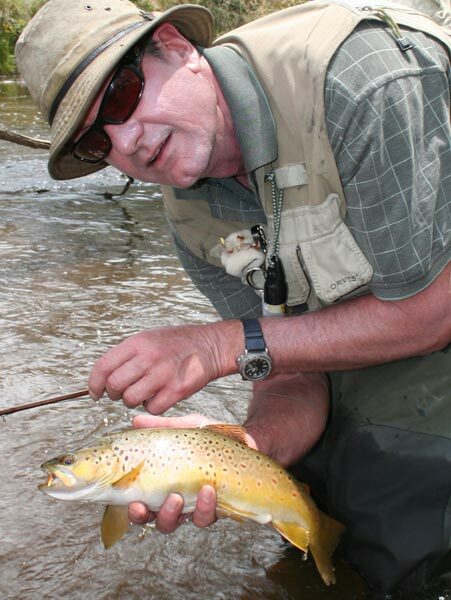 A nice brown trout for Richard Steiner. 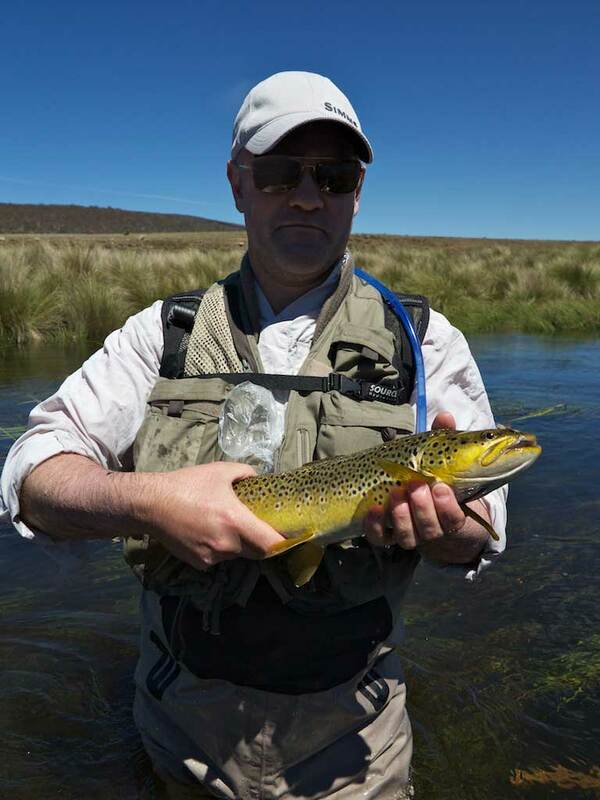 Tim into a nice Brown Trout. 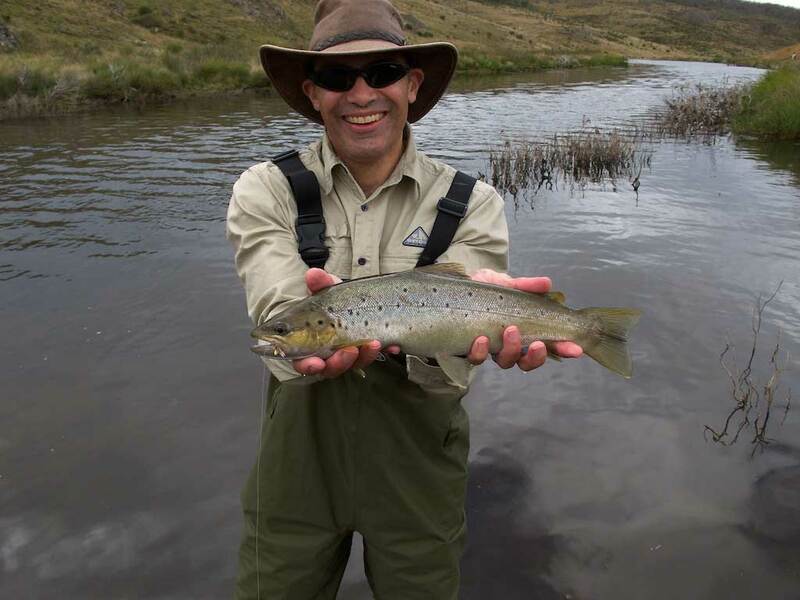 The 2012/13 season has opened with a some great fish on the dry fly. 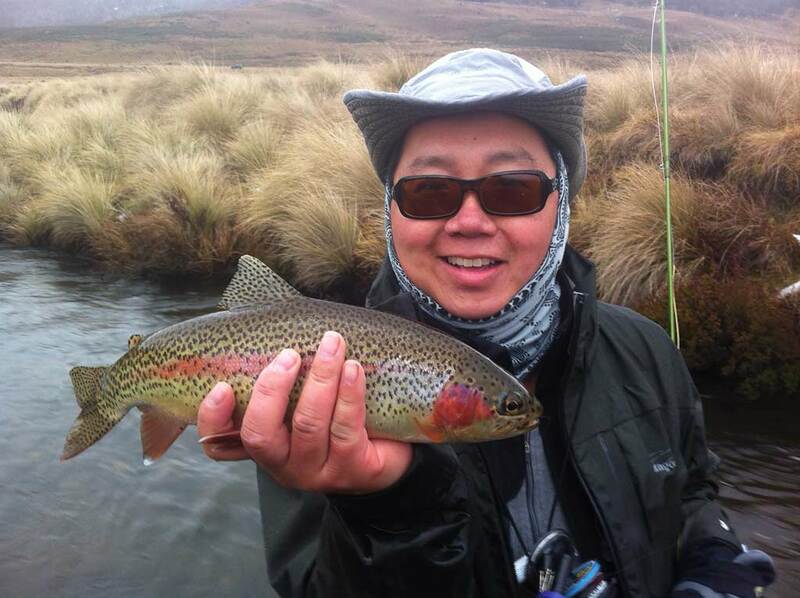 Some nice trout to end the season for An Dinh on his visit from Utah. 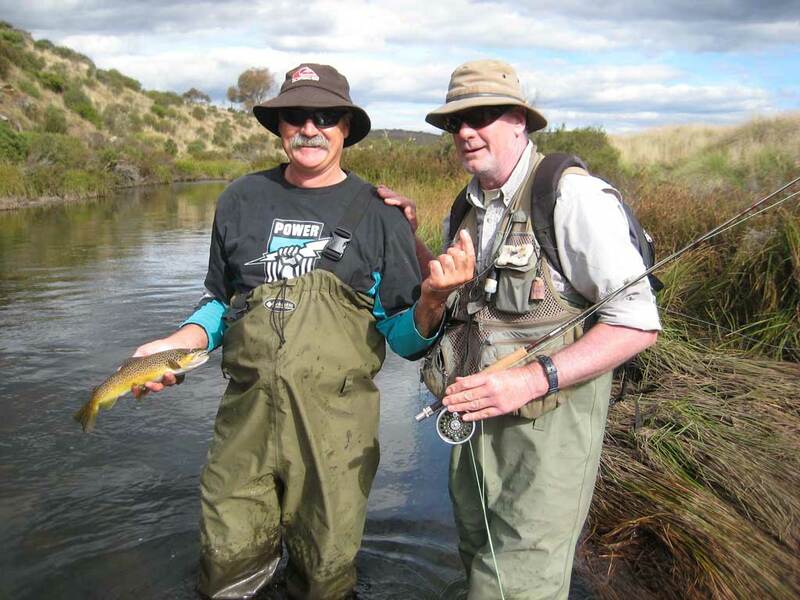 Wayne and Nat Shattock with their first trout on fly during their recent visit from Adelaide. 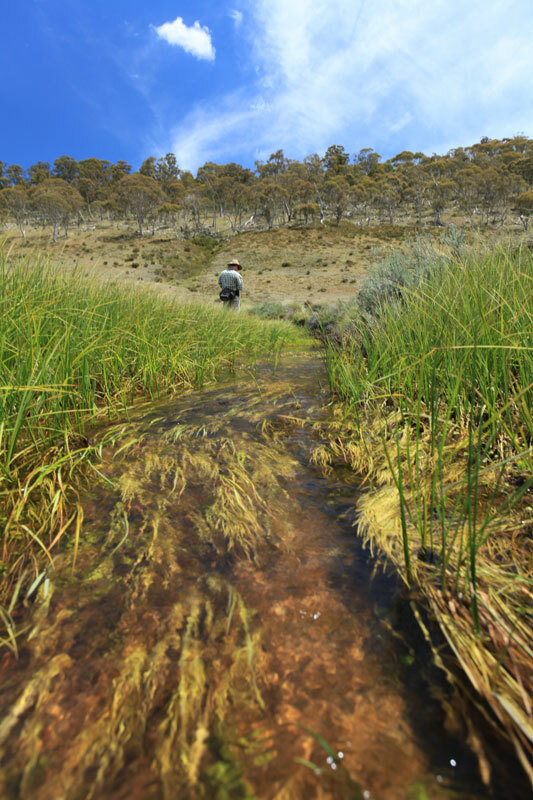 Bamboo Rodmaker Nick Taransky and I recently enjoyed some wonderful early summer dry fly fishing in the snowy mountains. 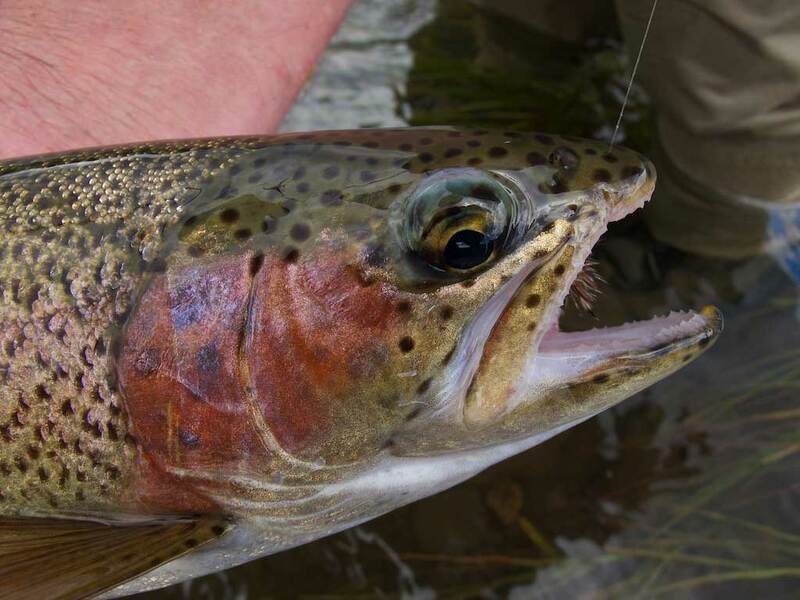 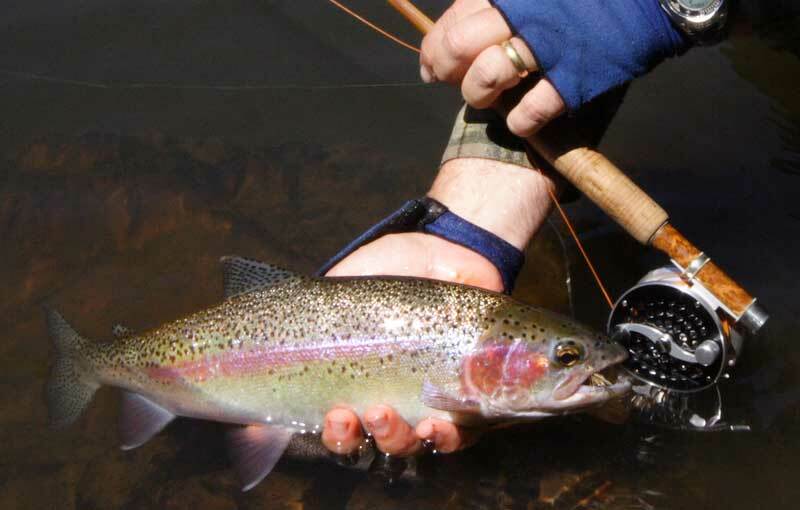 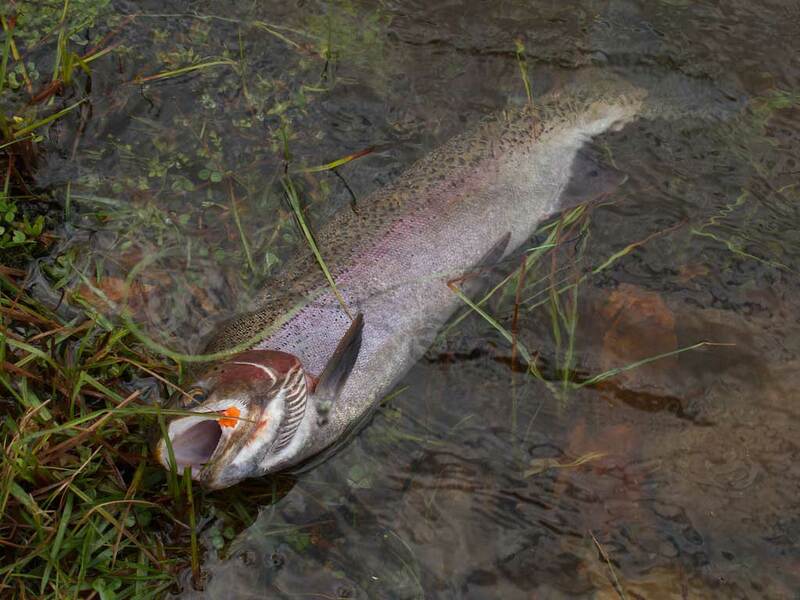 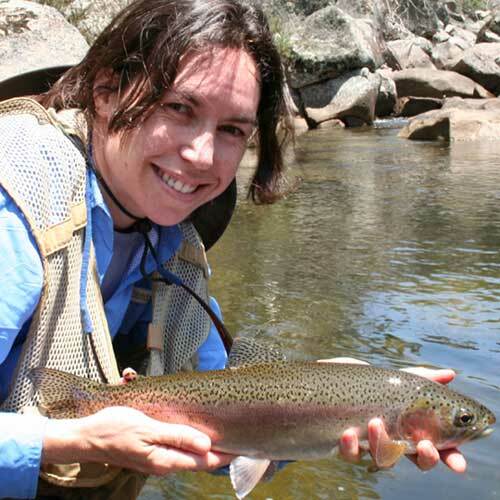 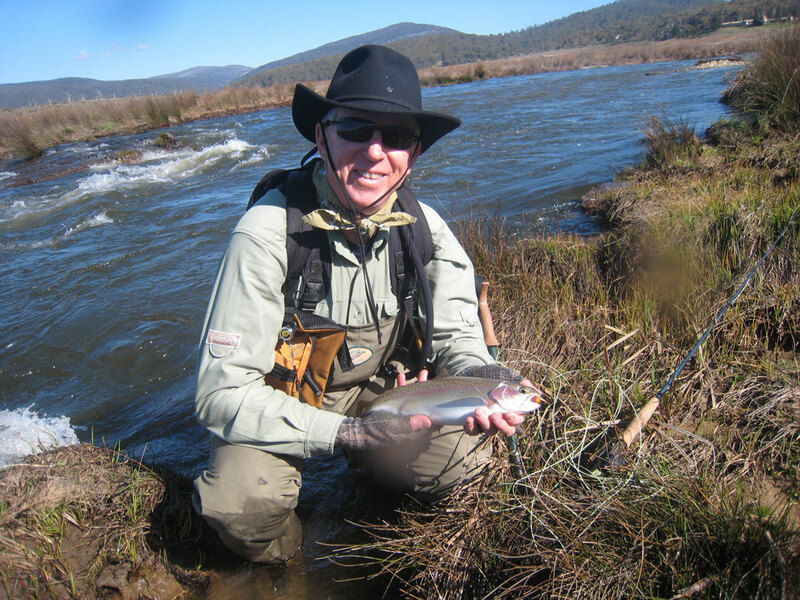 Typical early season Rainbow on the Glo Bug and a major water release in the Snowy River ! 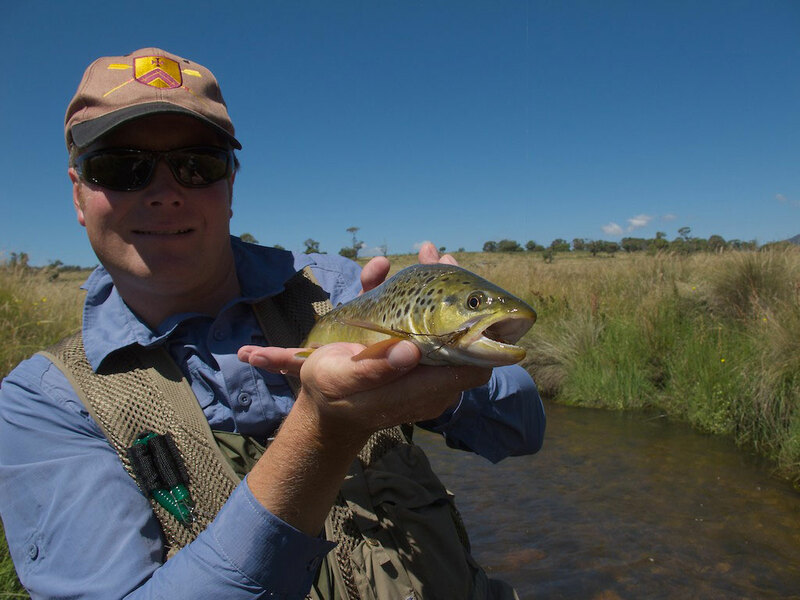 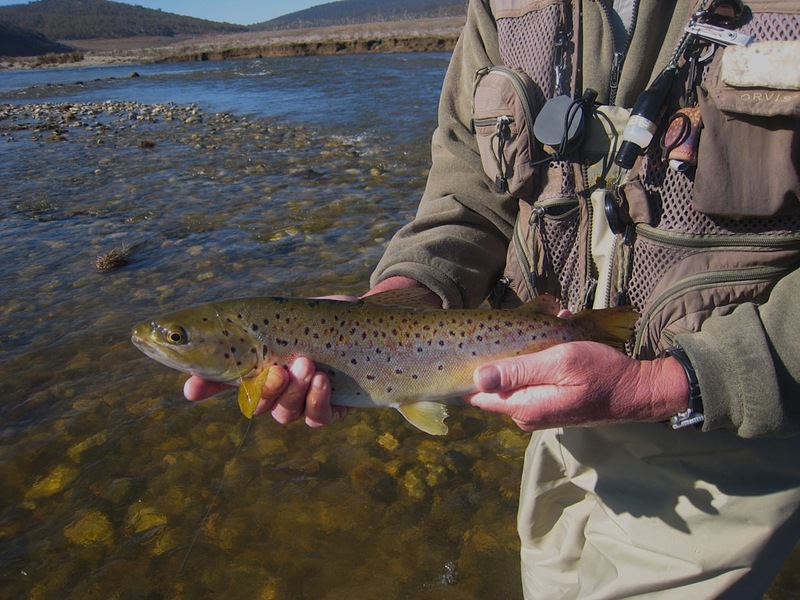 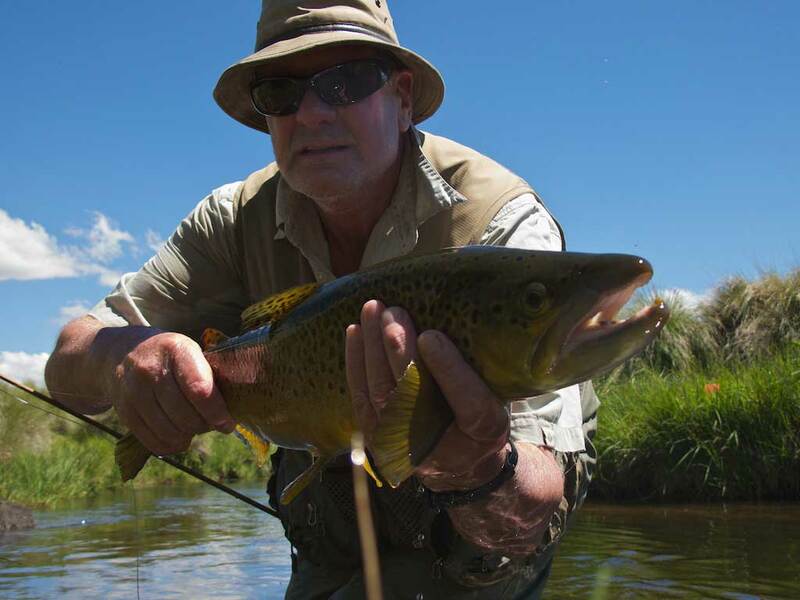 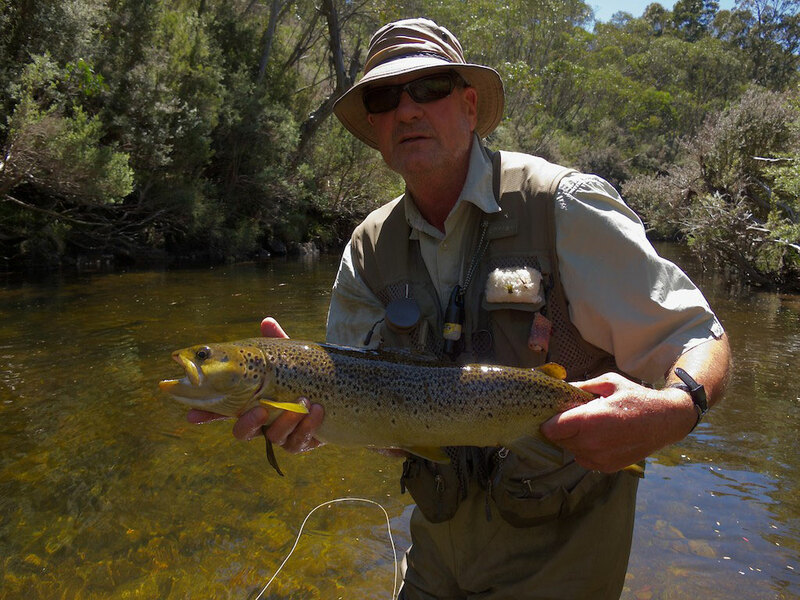 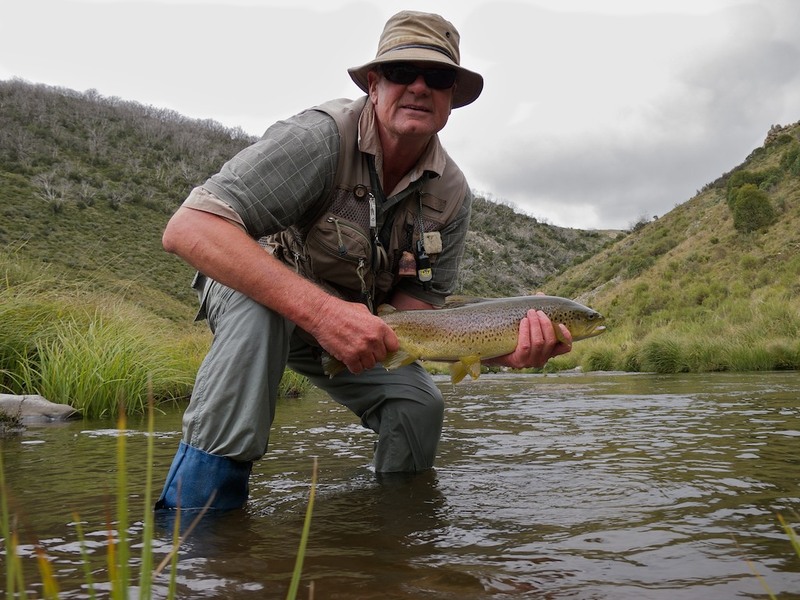 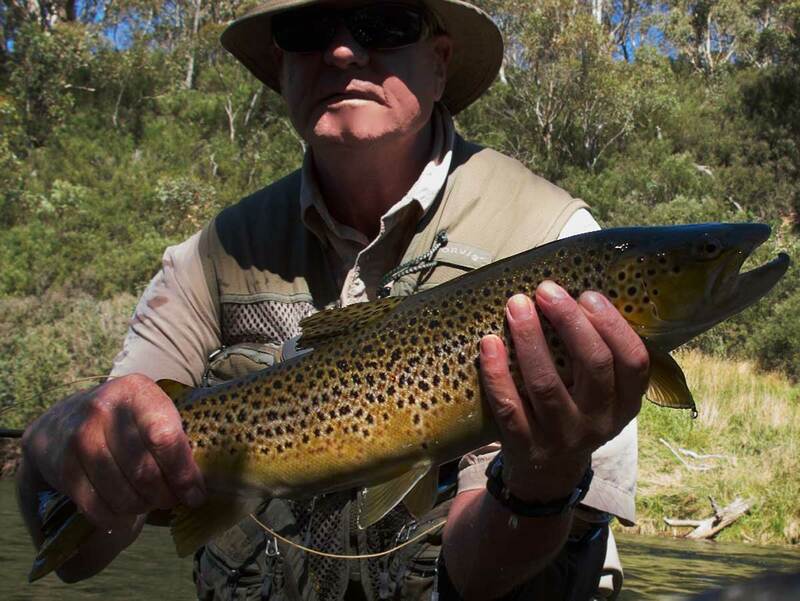 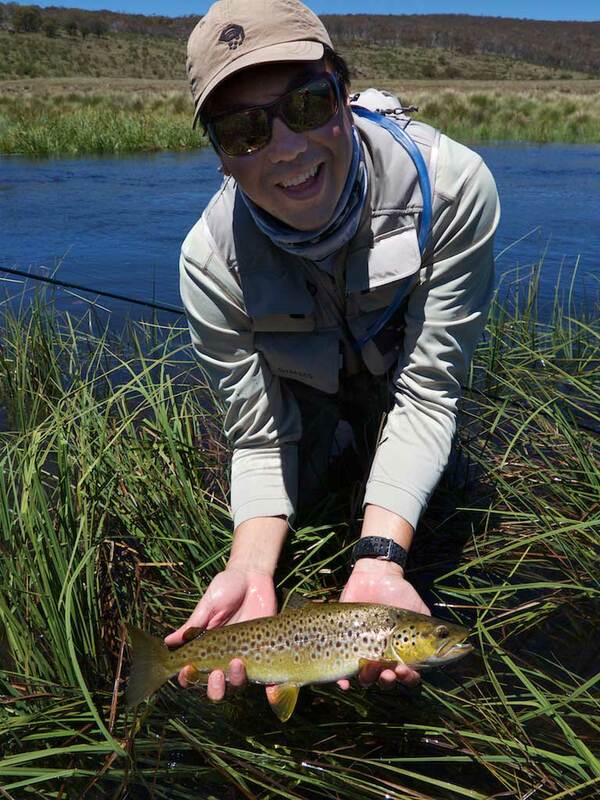 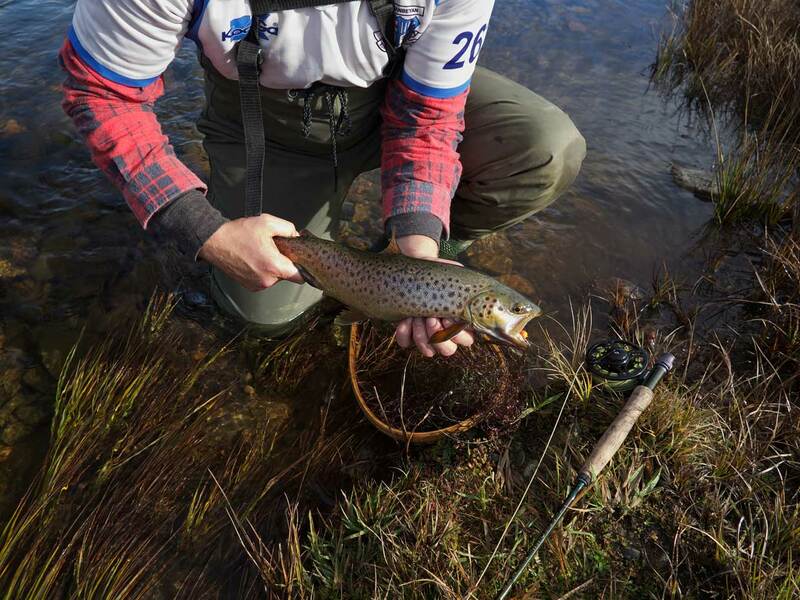 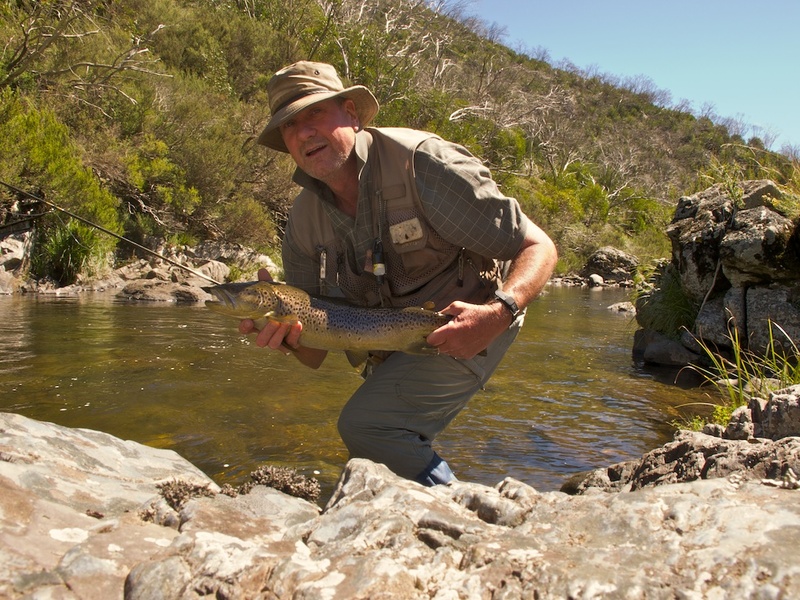 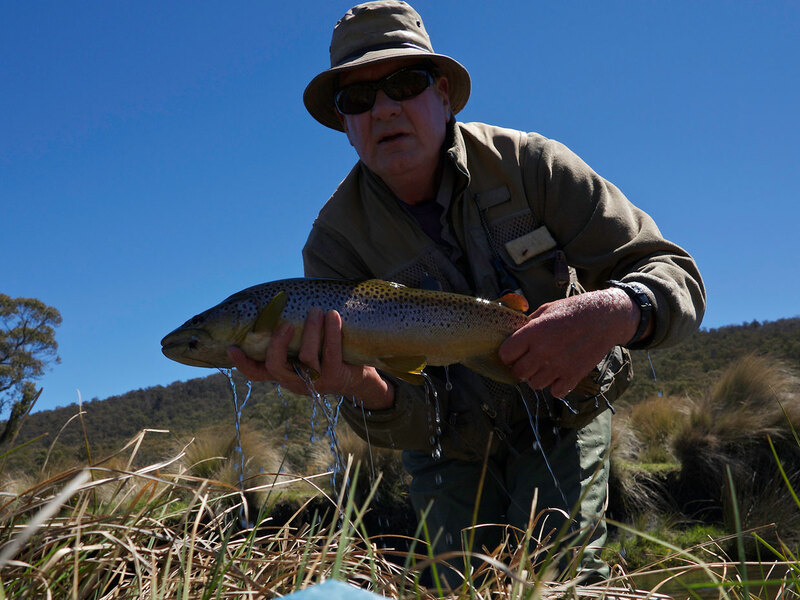 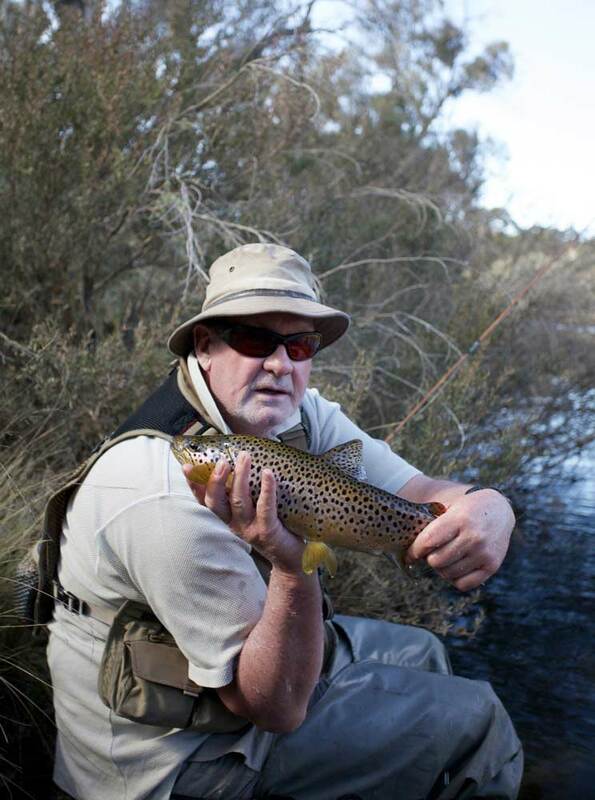 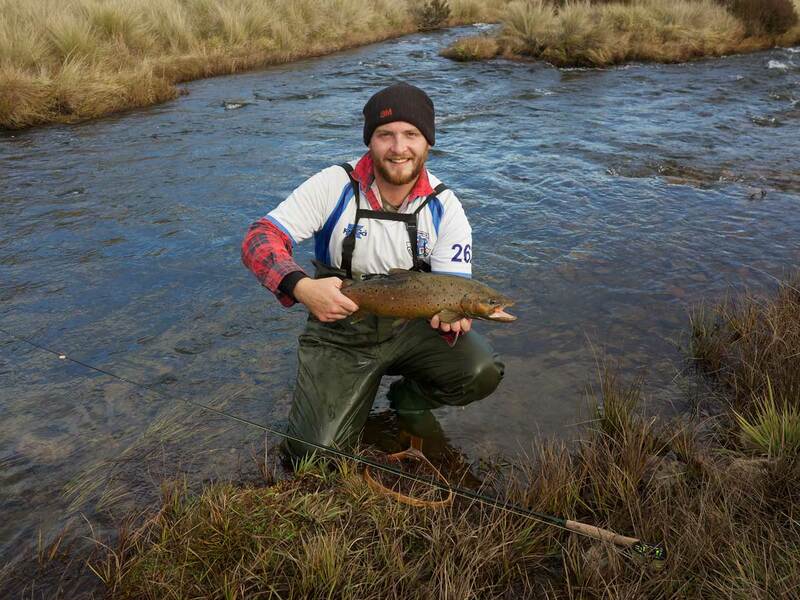 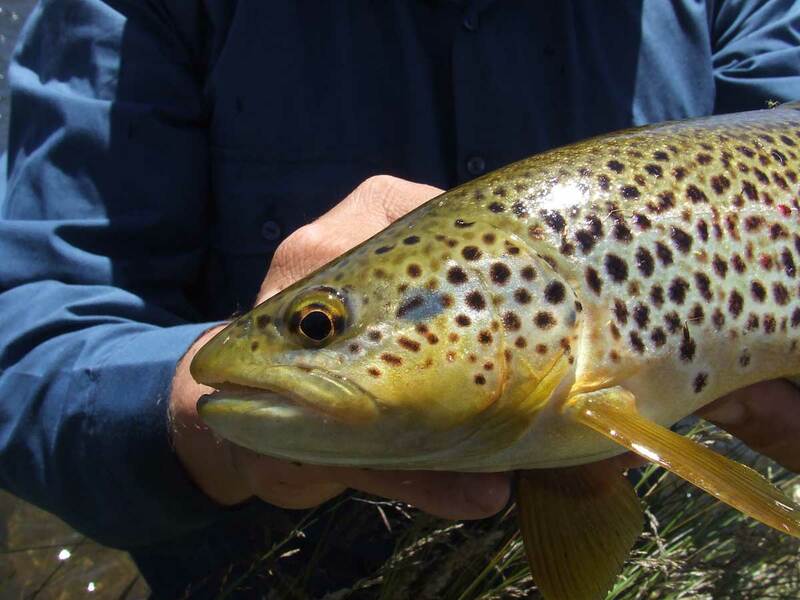 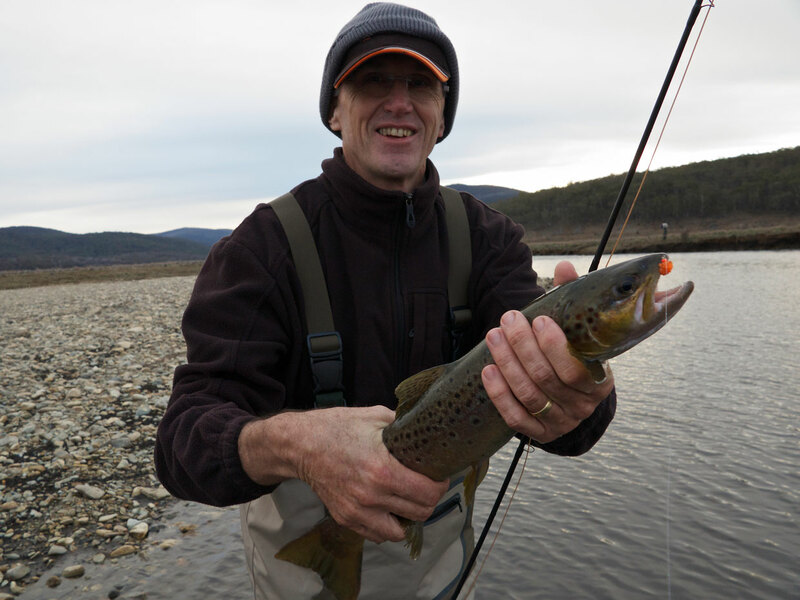 Ian MacLachlan with a lively Thredbo River brown trout. 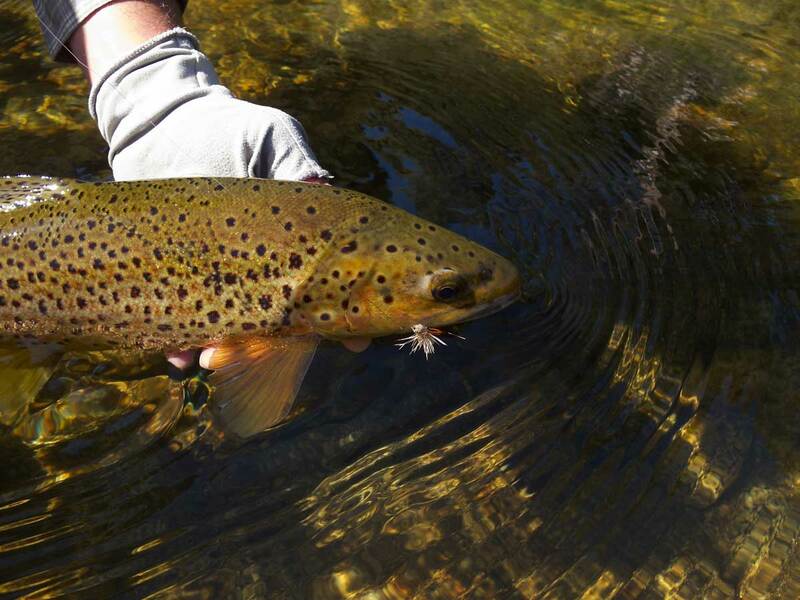 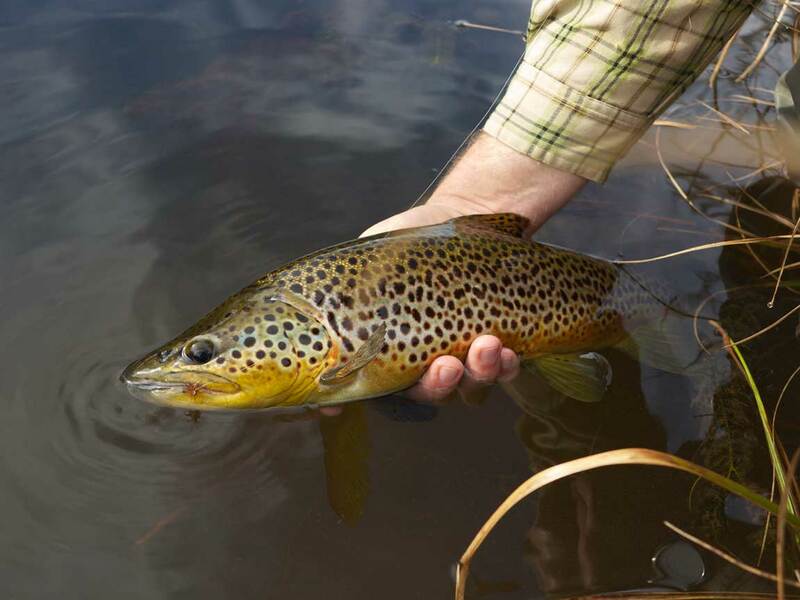 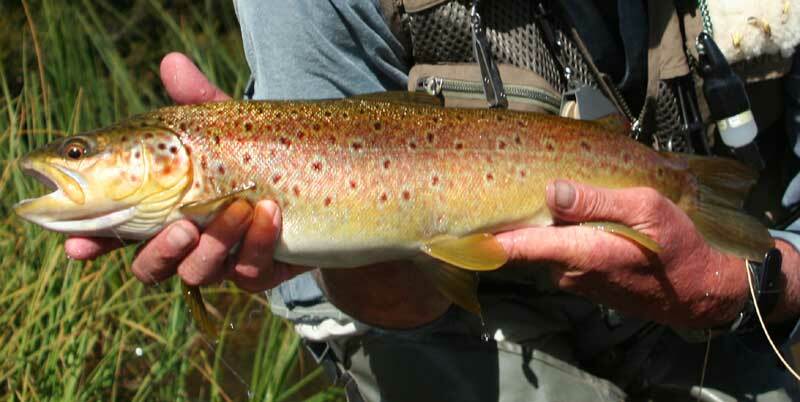 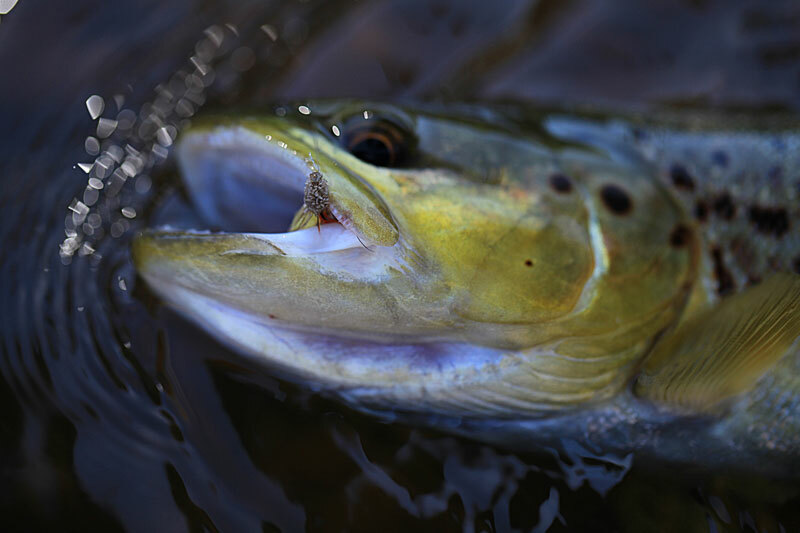 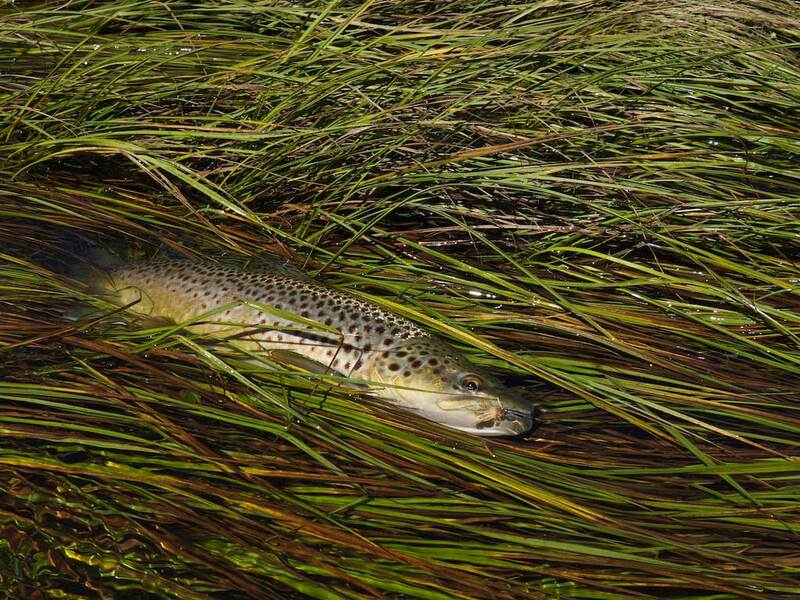 There's some fantastic fly fishing to be had this season - some beautiful Autumn browns. 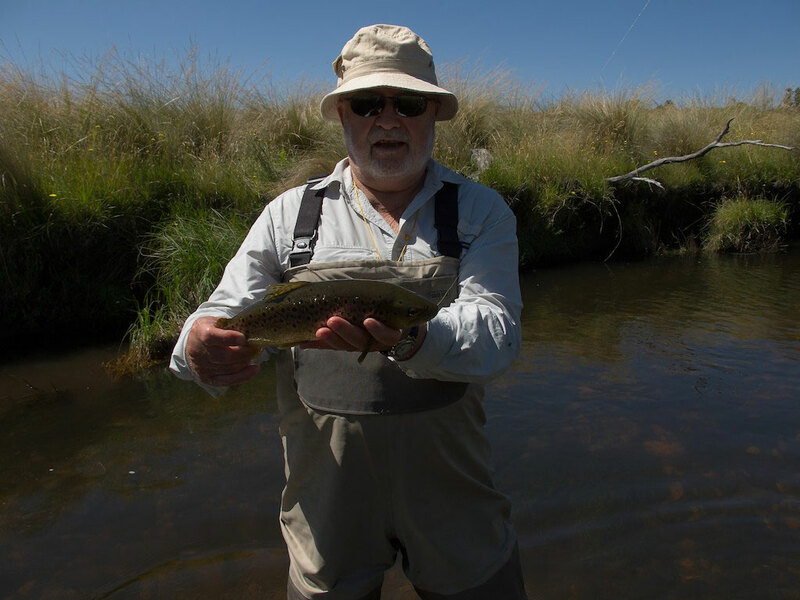 Phil and his father - Dr David David enjoying fly fishing the high country rivers. 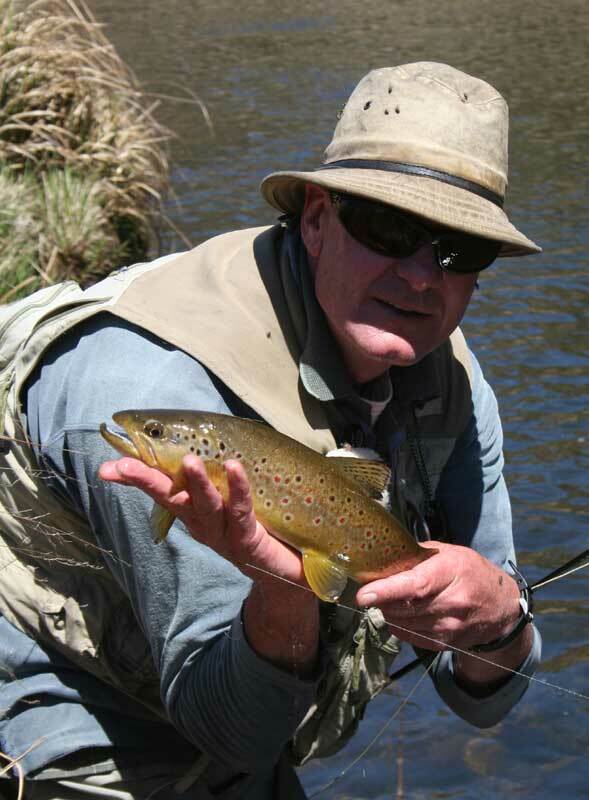 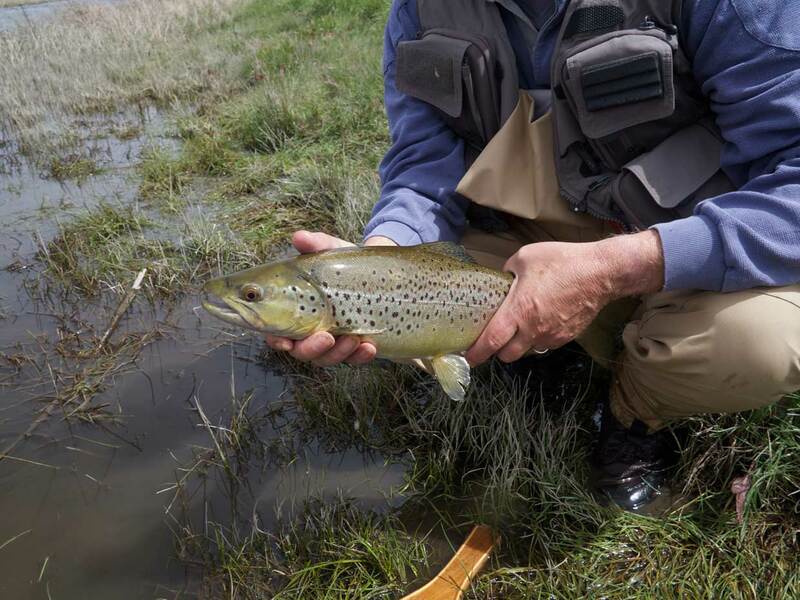 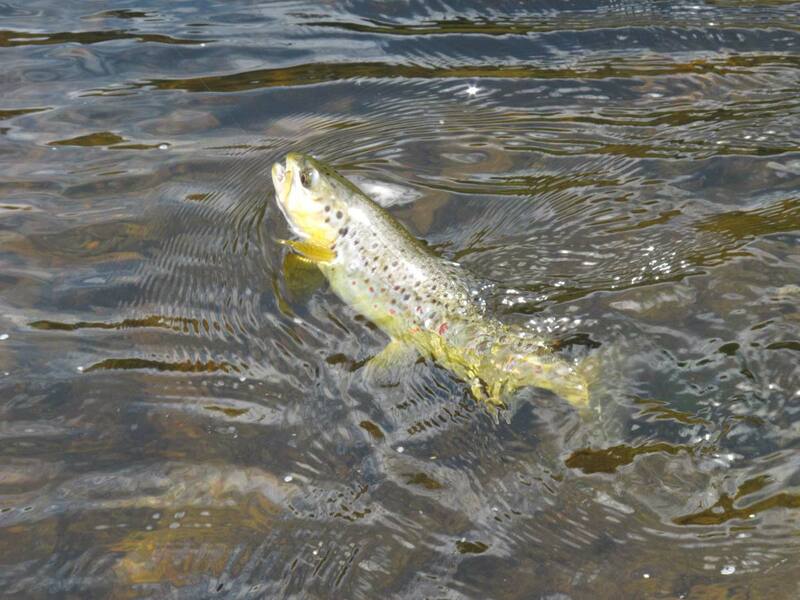 Visiting British fly fisher John Dumont enjoyed an encounter with a fat brownie. 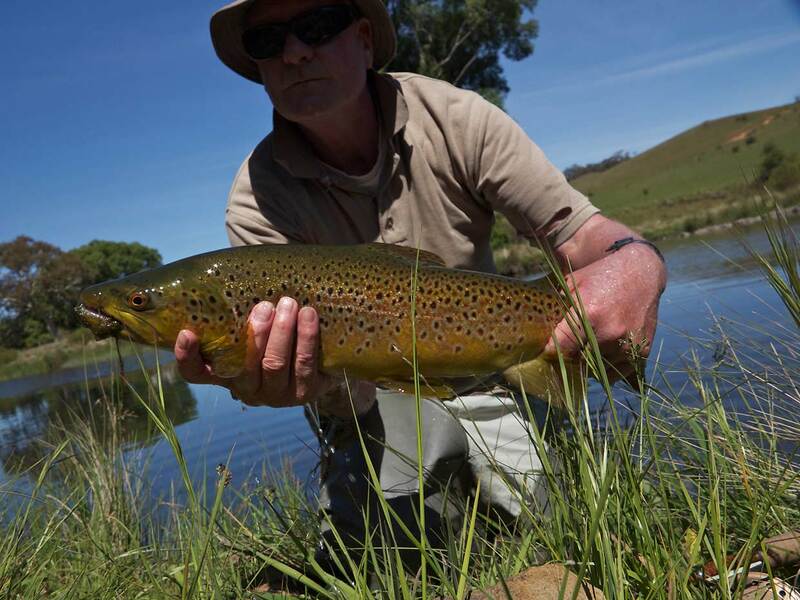 The best rain for years has produced excellent fish. 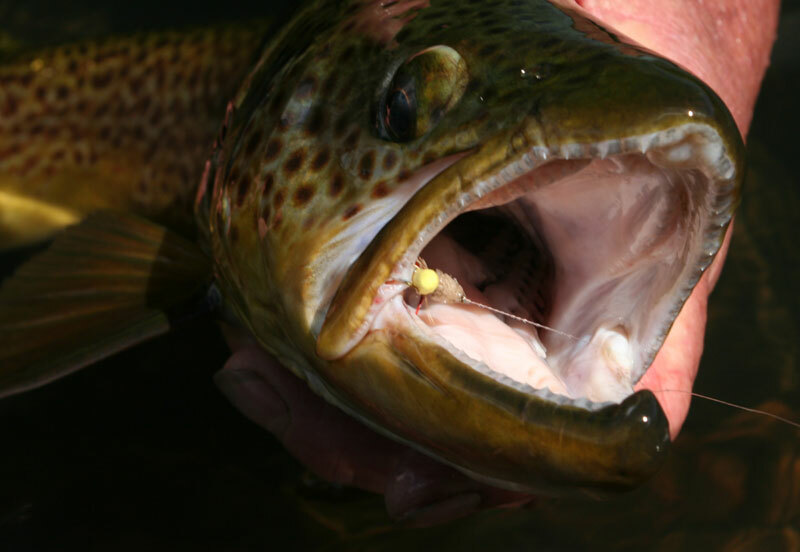 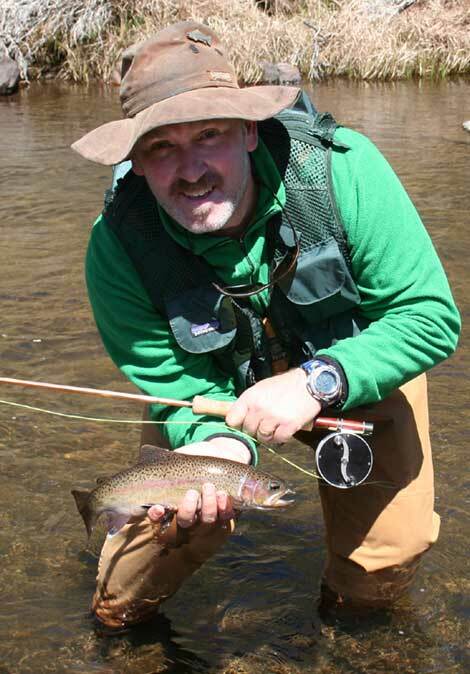 The season continues to produce some great fly fishing. 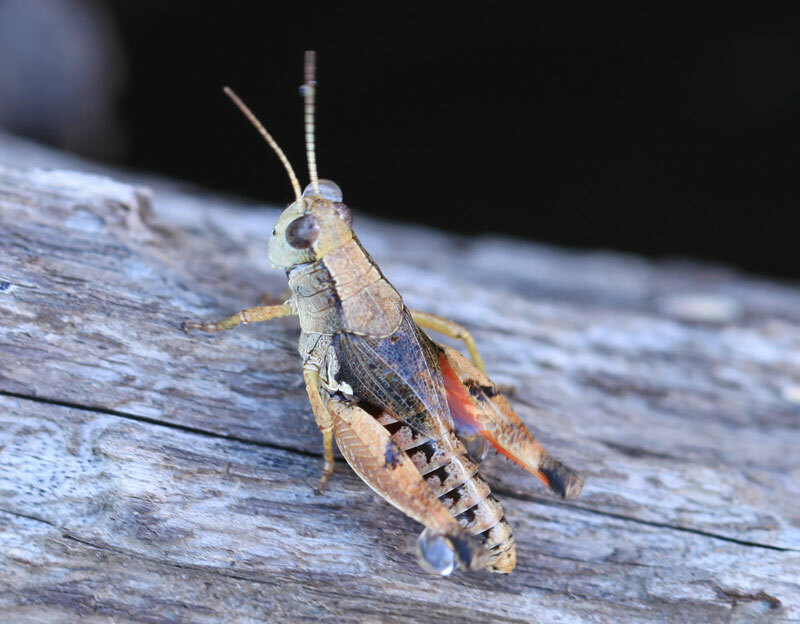 Henry and Aleco getting some on hoppers. 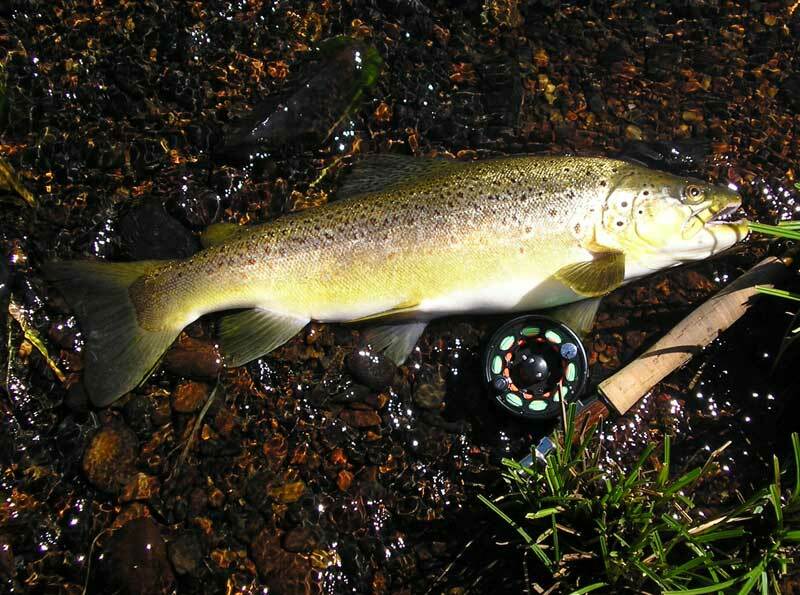 Some recent fish on the hopper. 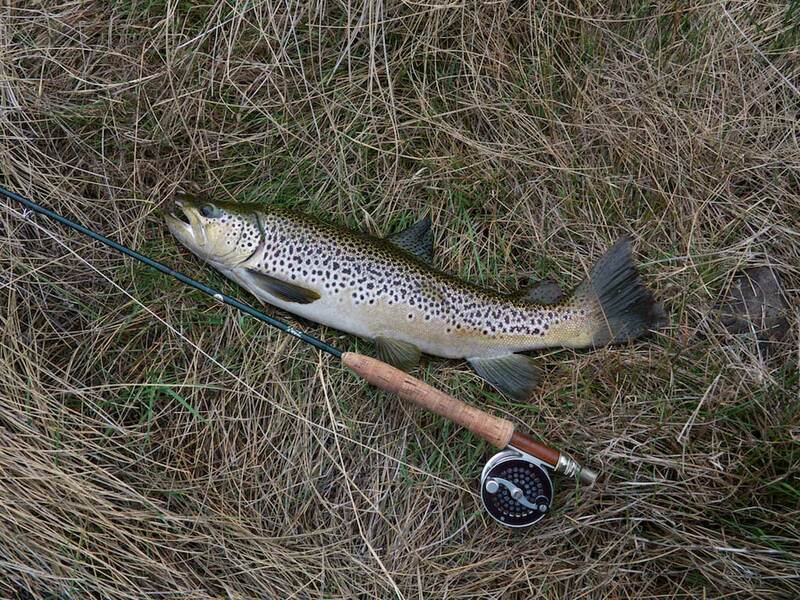 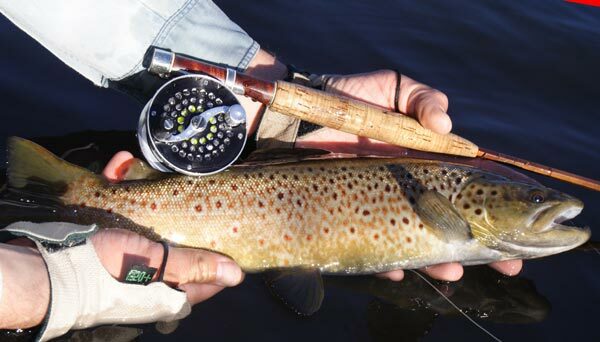 Troy Macnab with a thumping Snowies brown trout on his wonderful Taransky Bamboo fly rod. 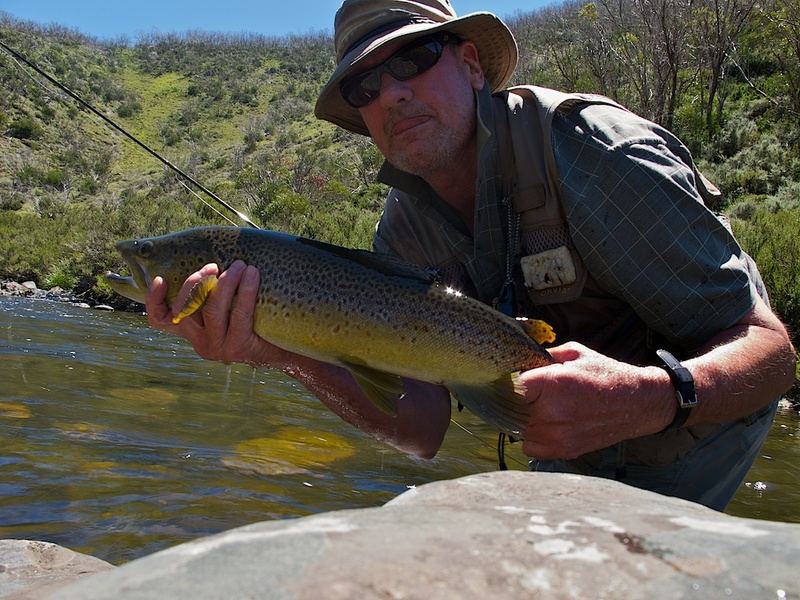 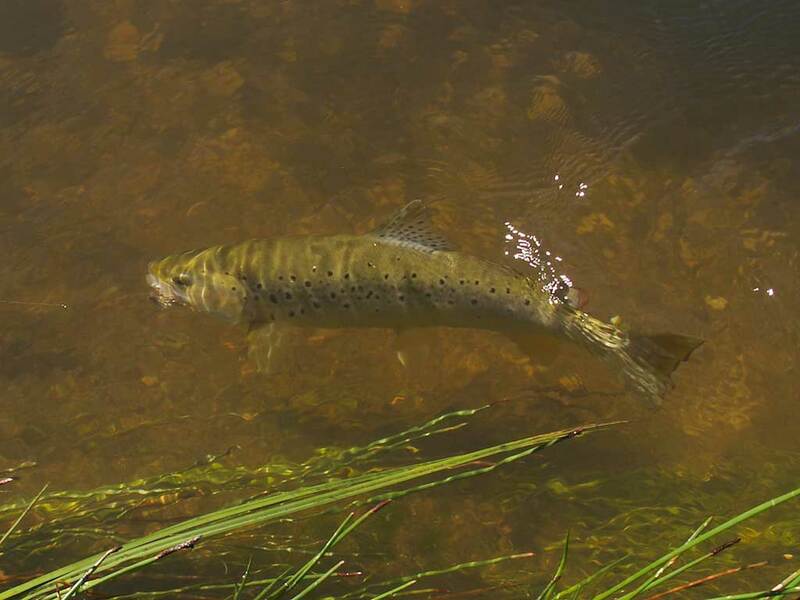 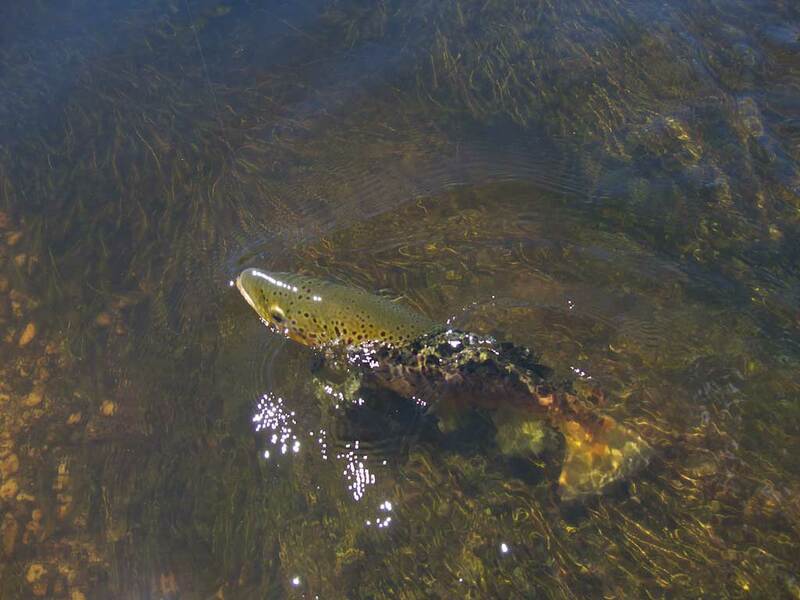 A nice brown trout from the Snowy Mountains - there's been some good mayfly hatches. 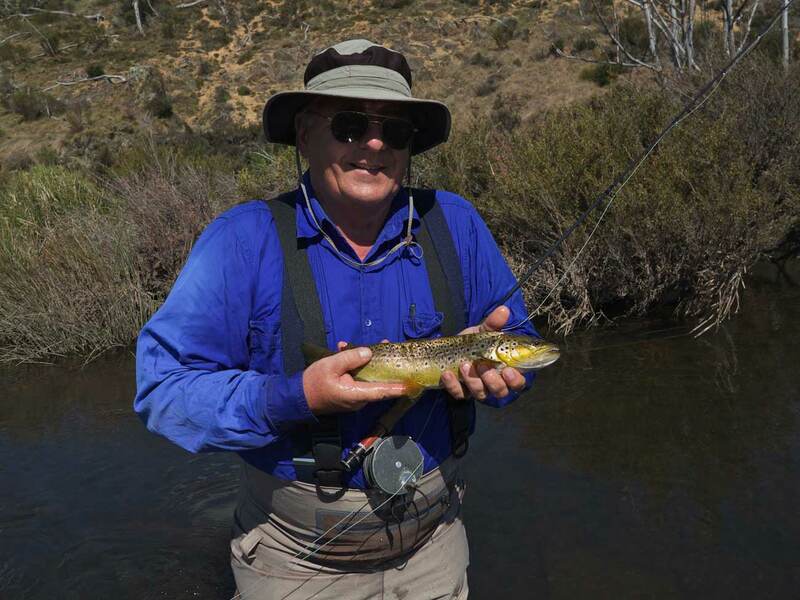 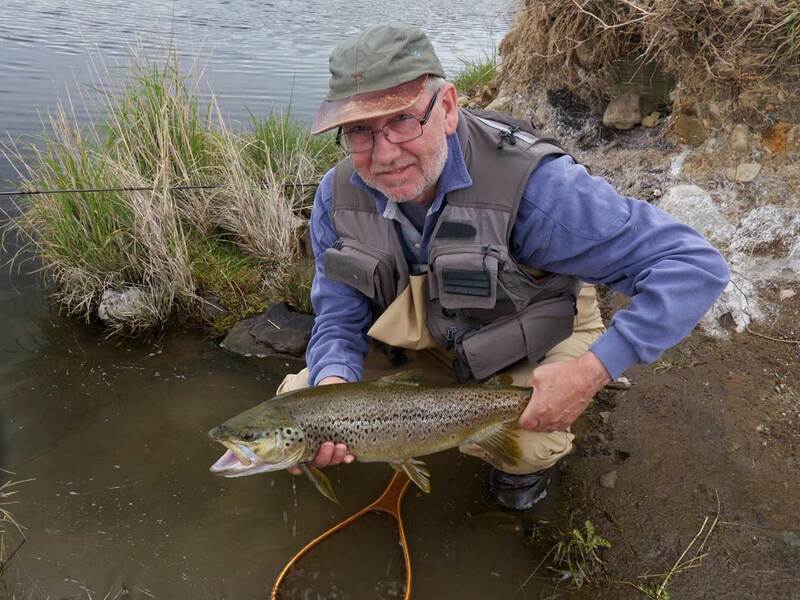 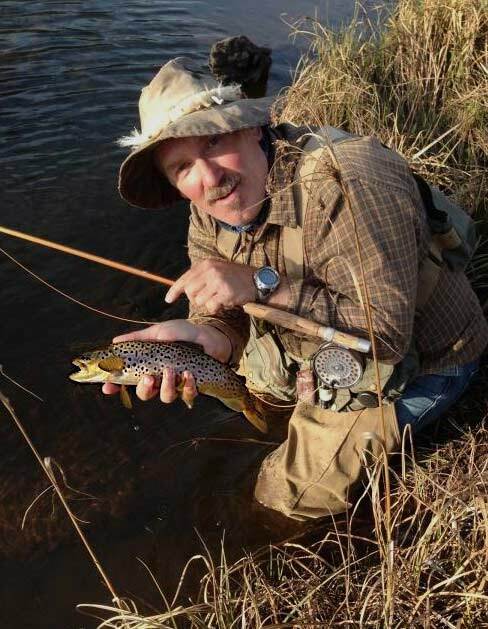 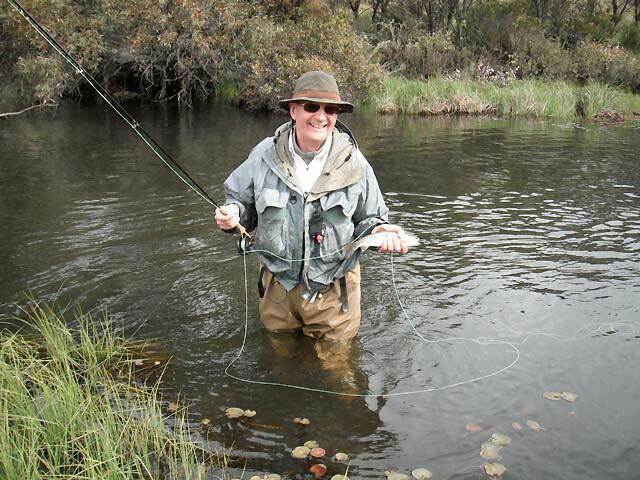 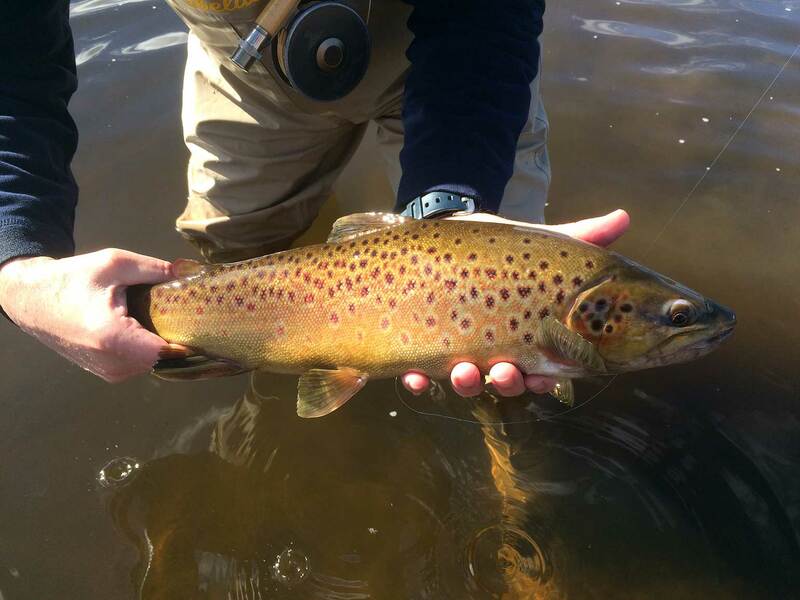 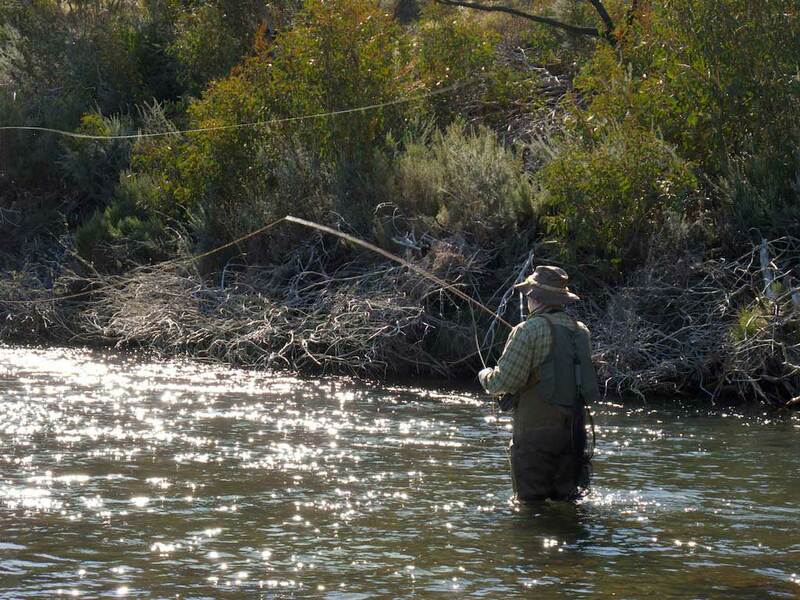 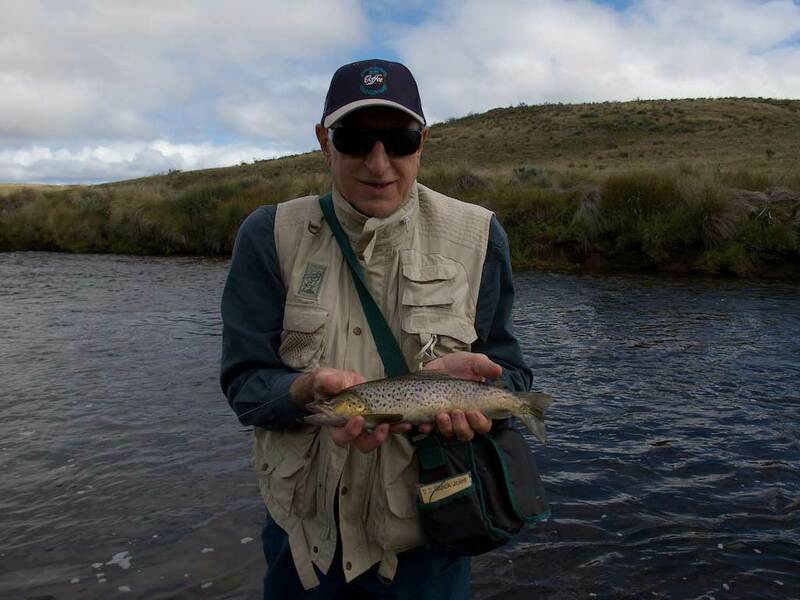 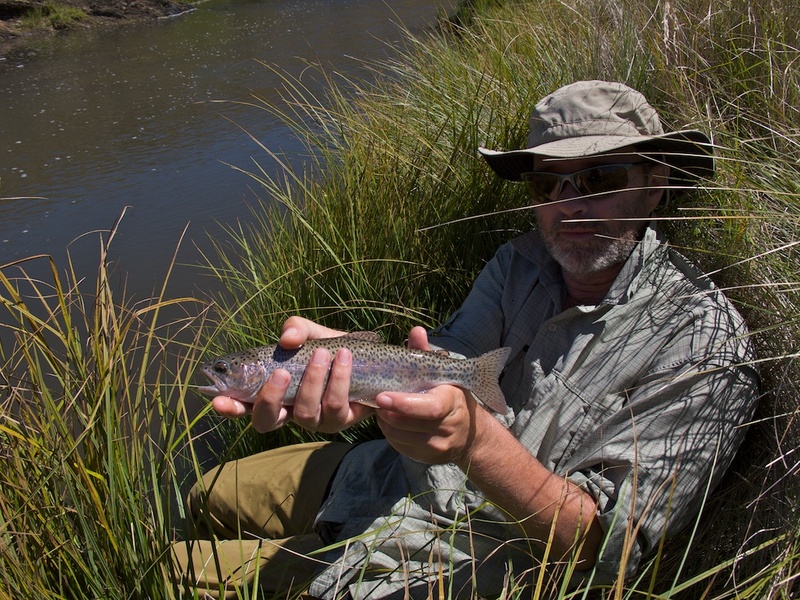 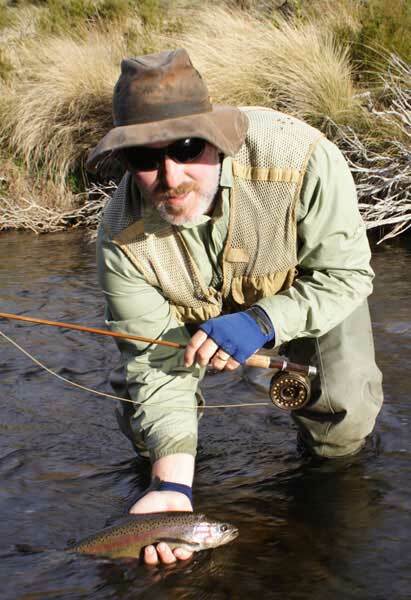 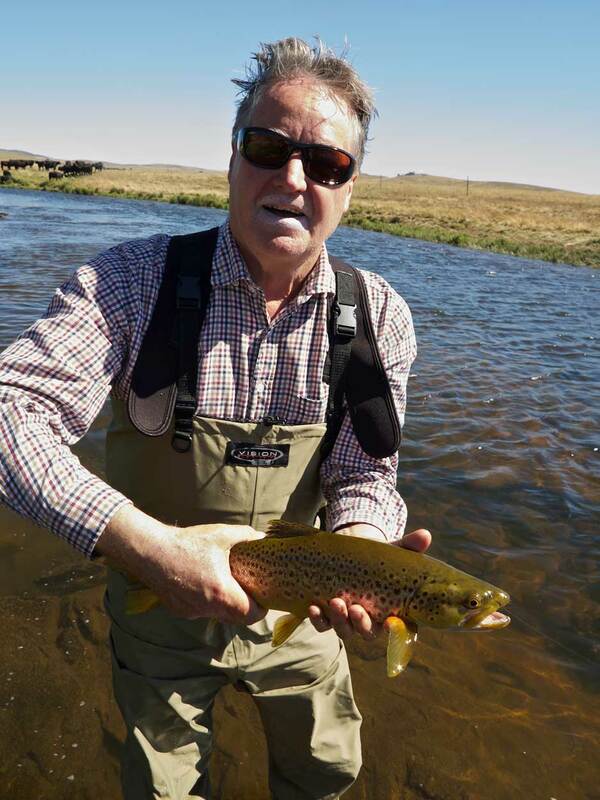 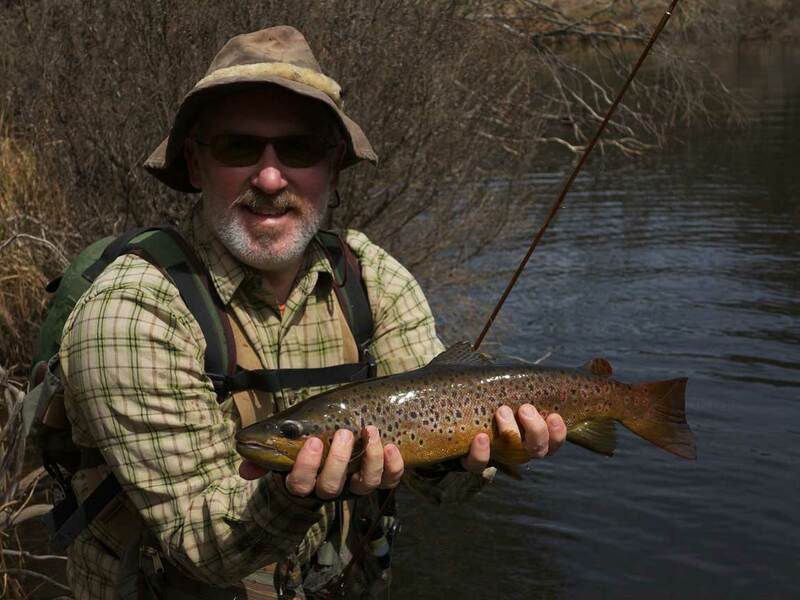 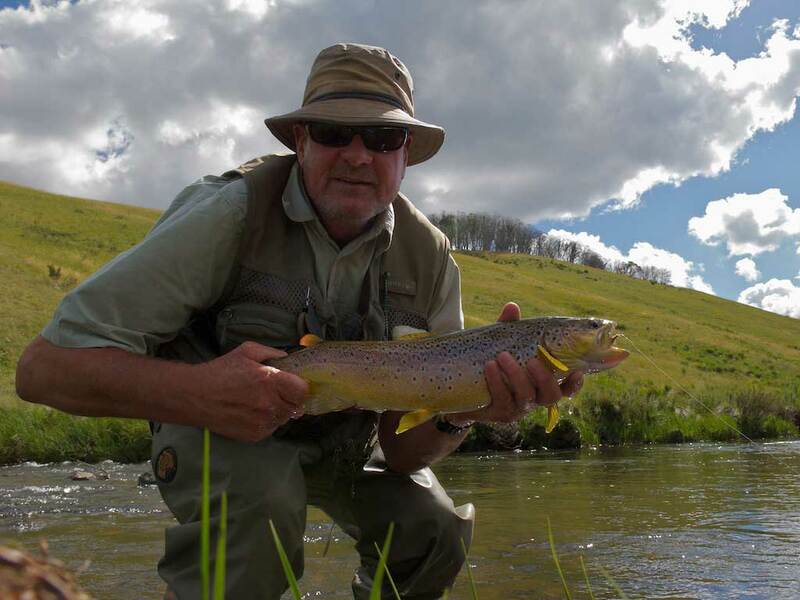 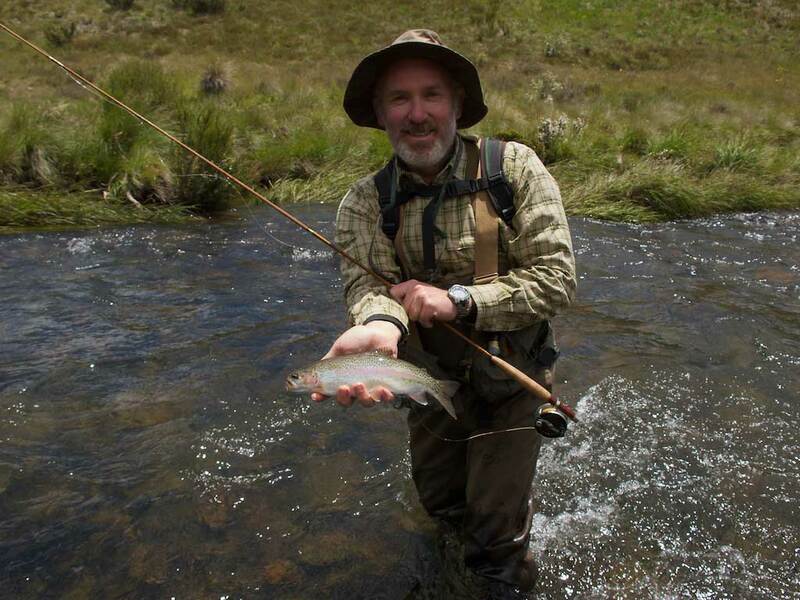 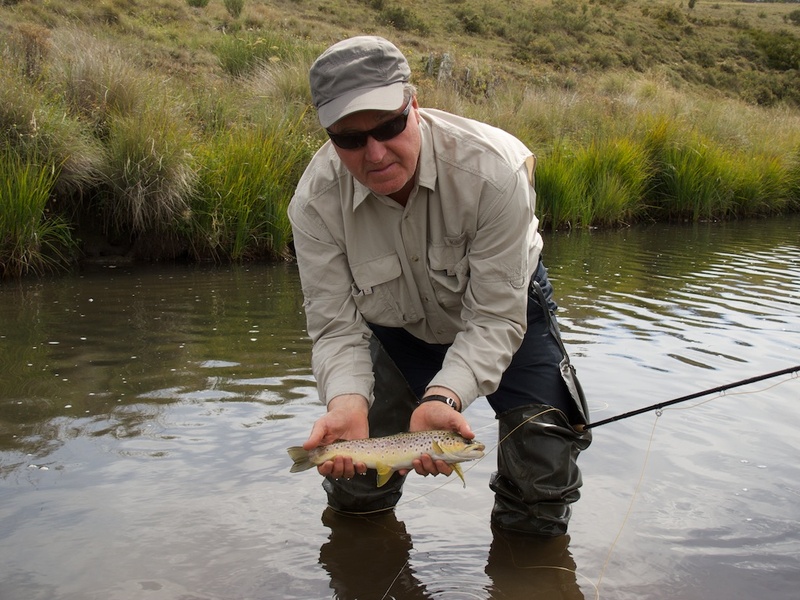 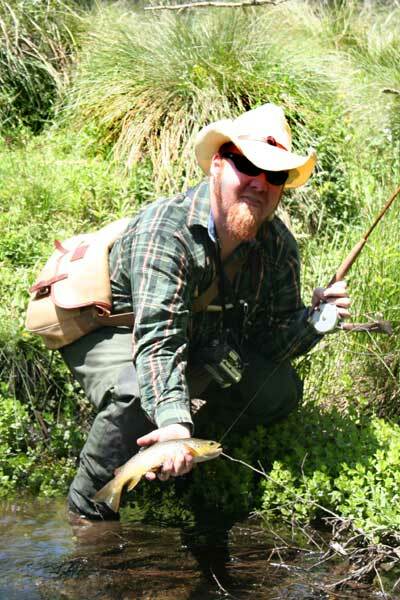 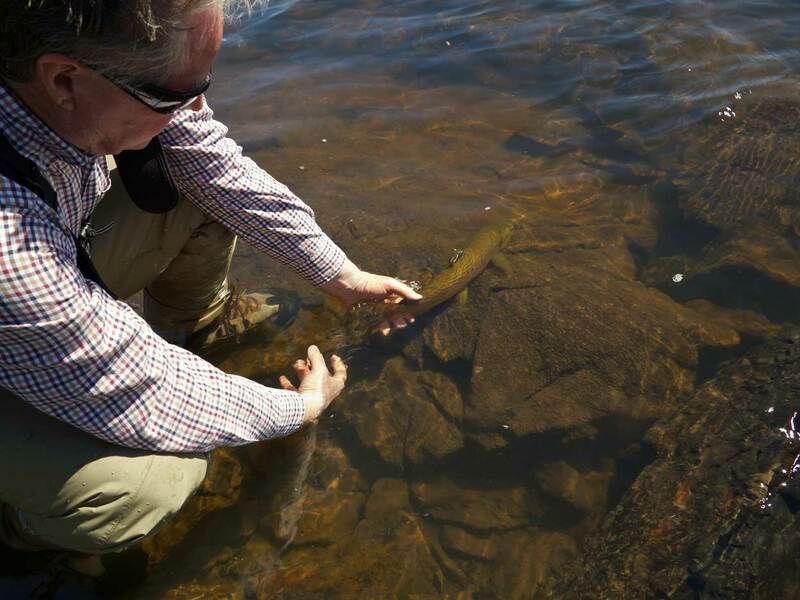 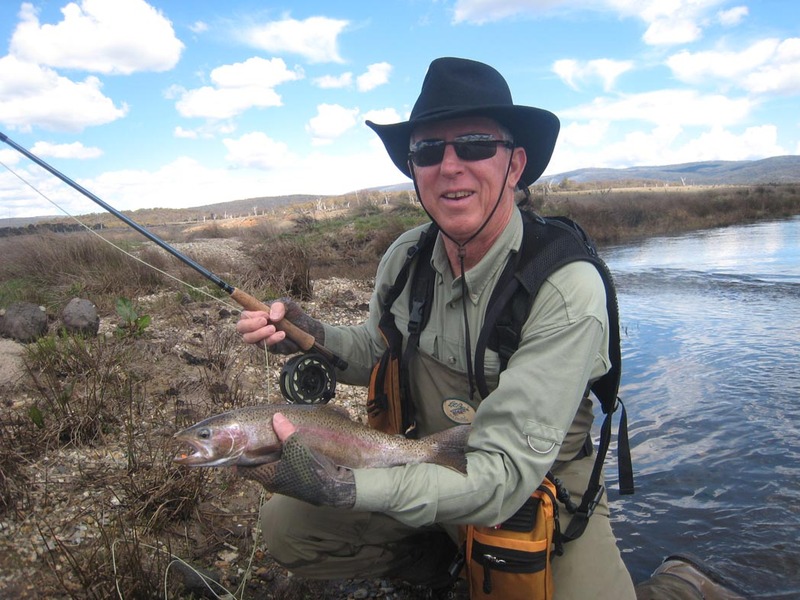 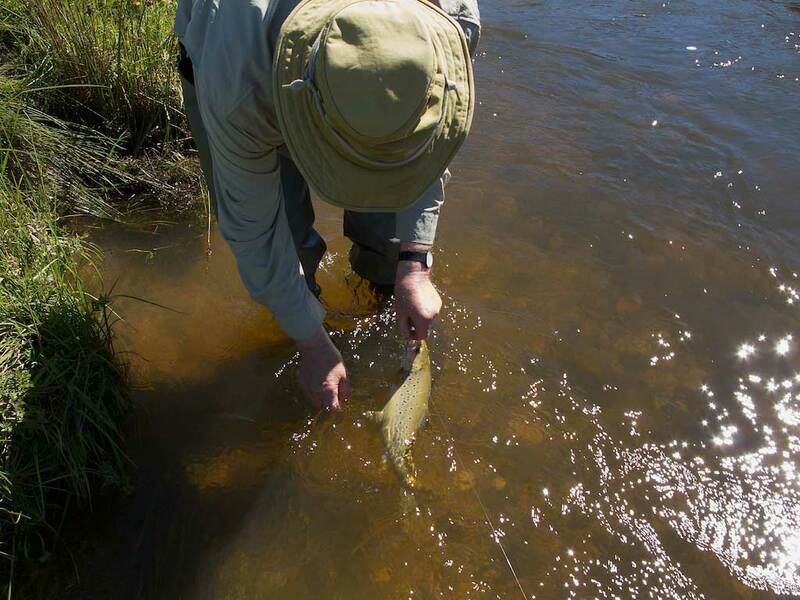 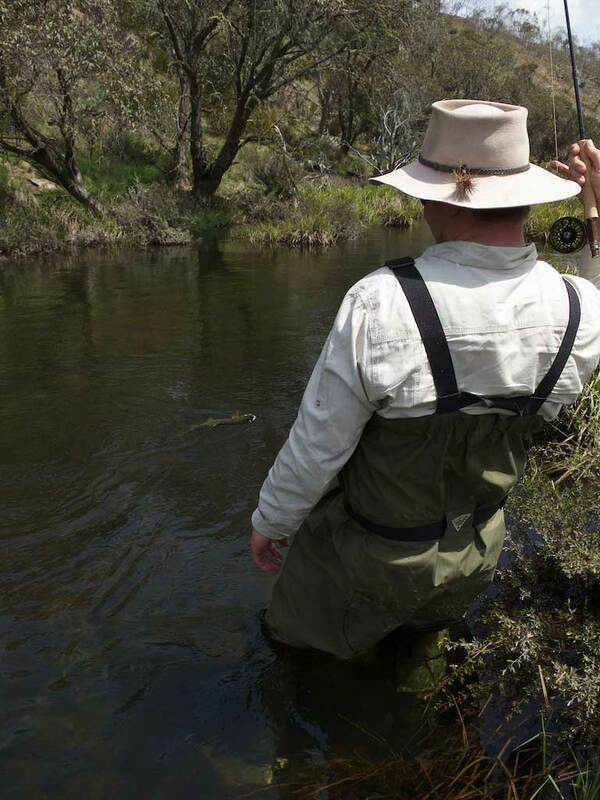 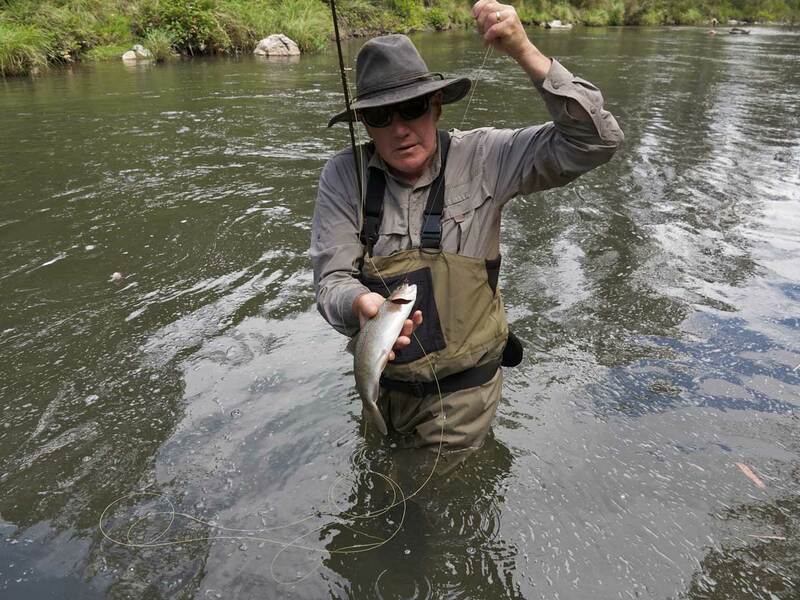 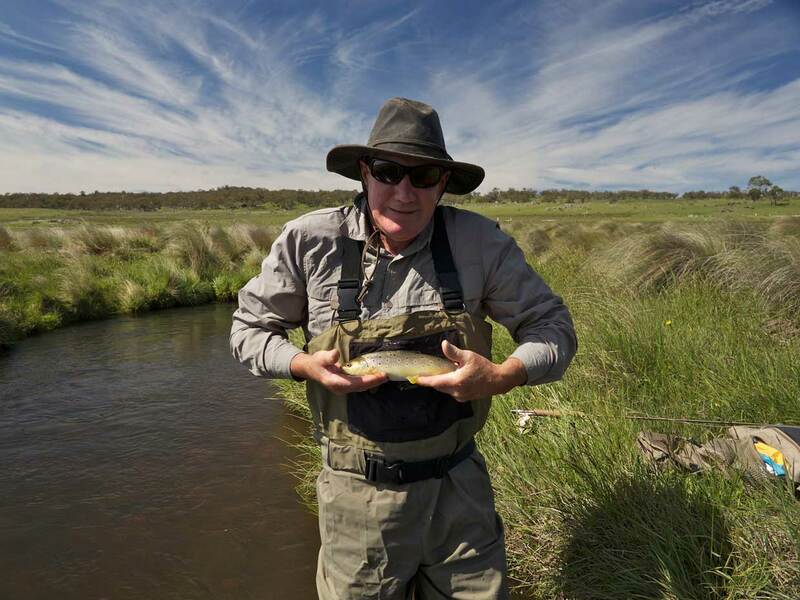 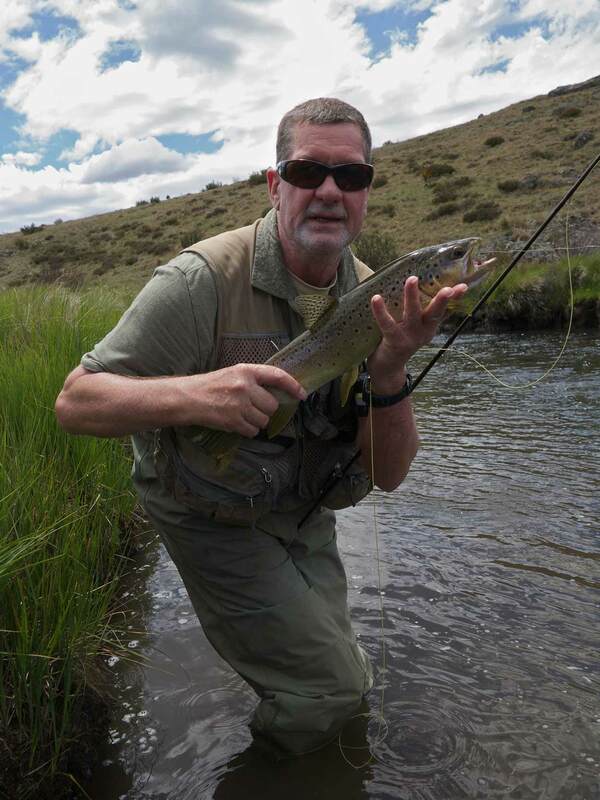 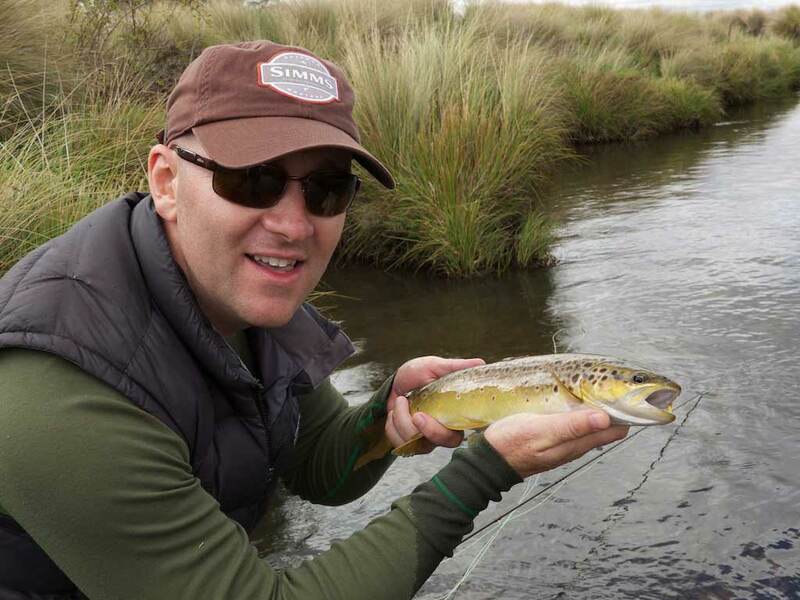 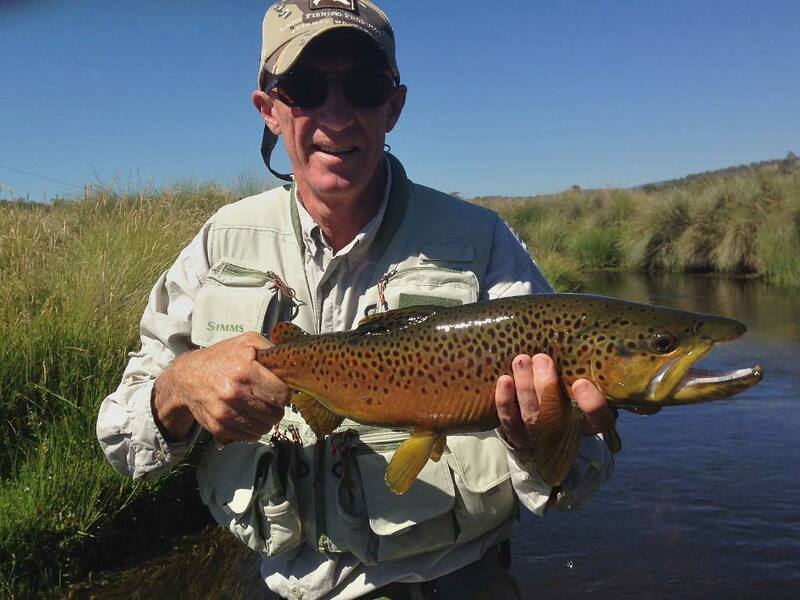 Steve Halstead of Maryland U.S.A. enjoying fly fishing on the Eucumbene River. 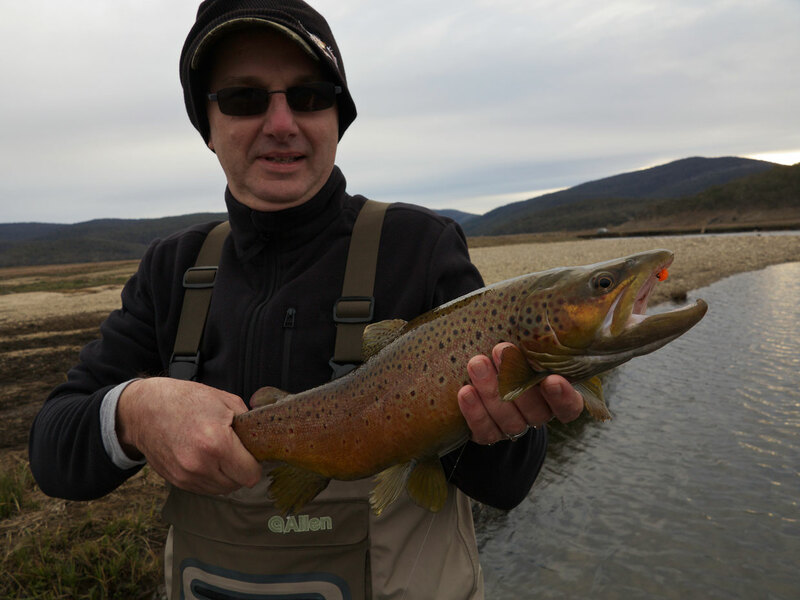 Nice brown trout from up Kosciuszko way. 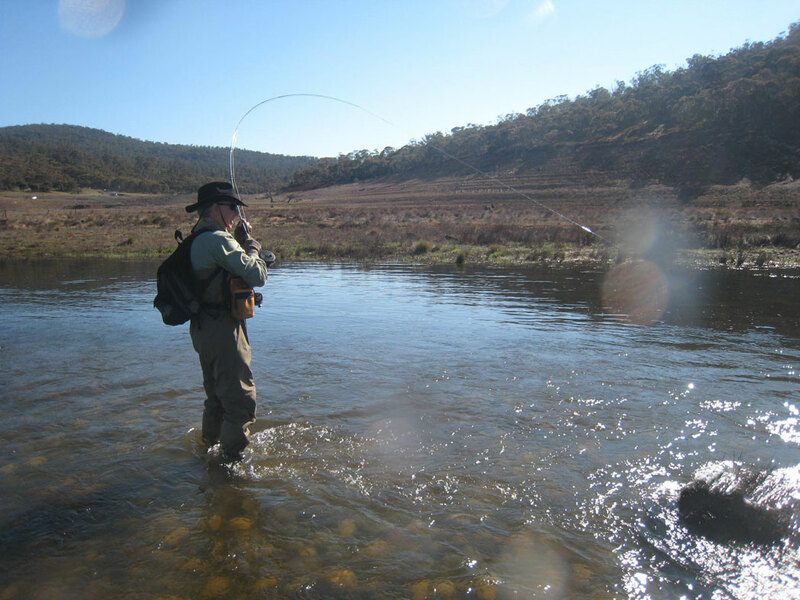 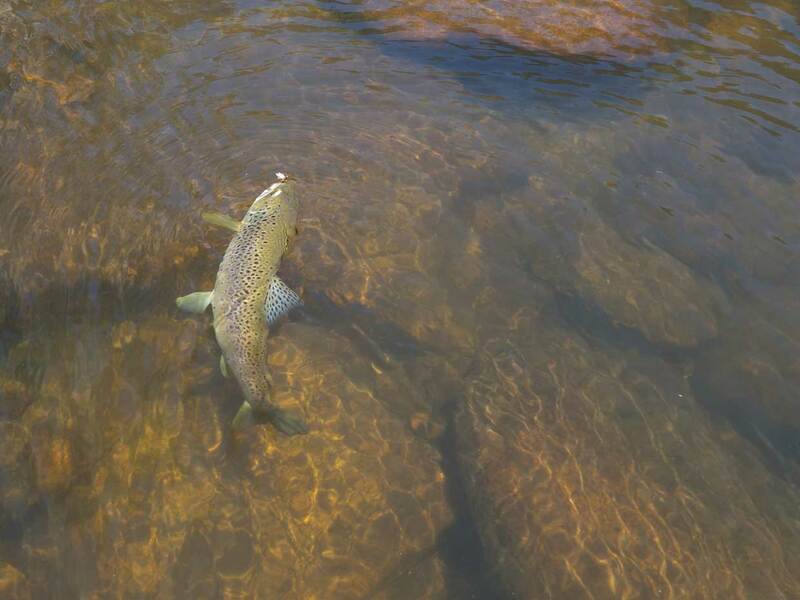 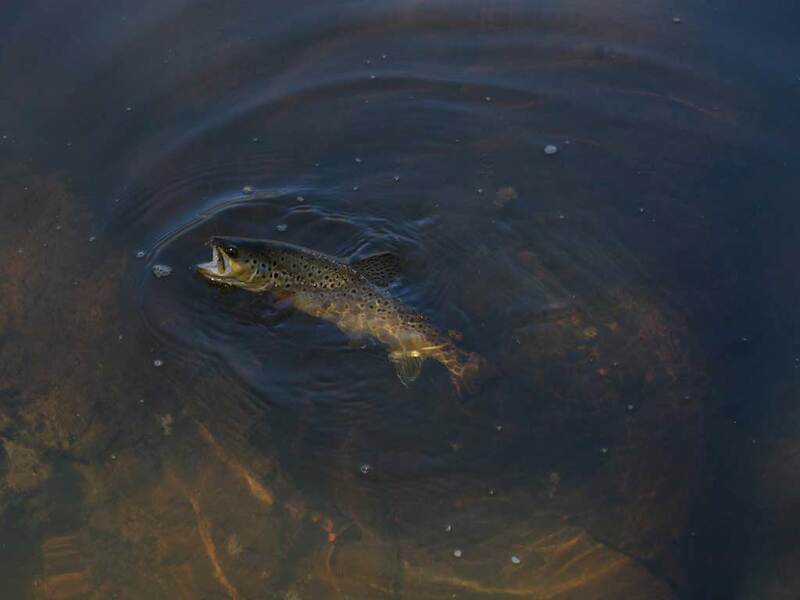 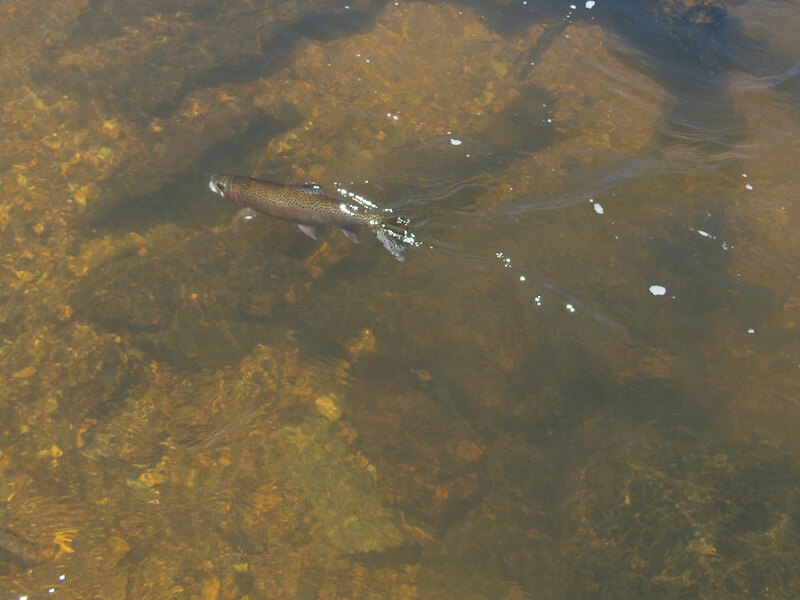 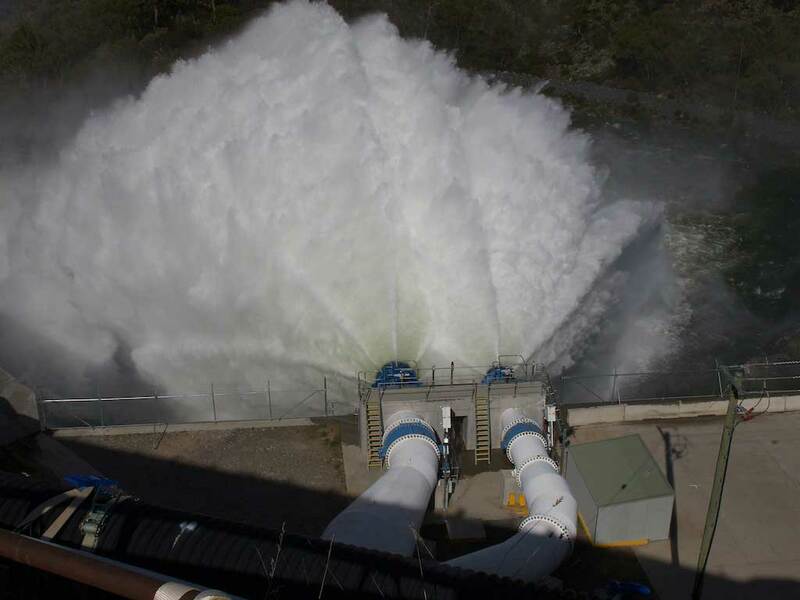 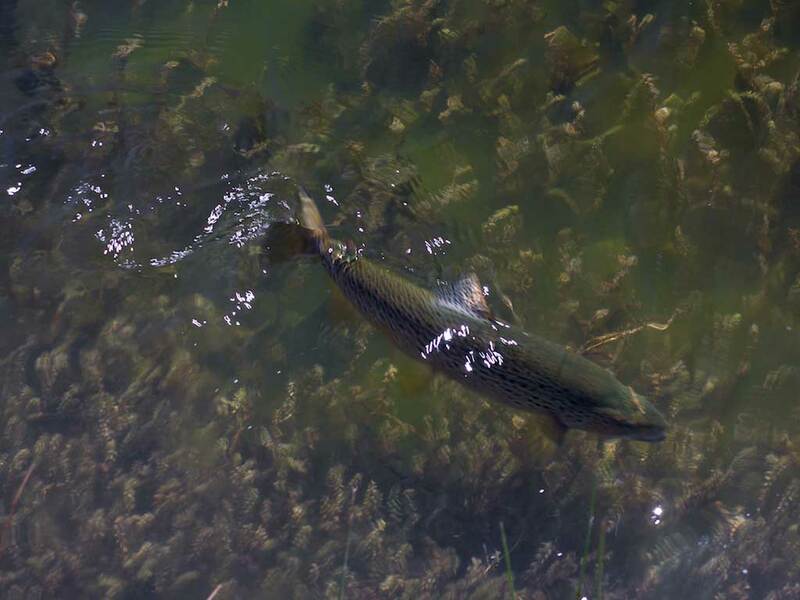 Early and late season sees good sized fish run up the rivers from the Snowy hydro lakes after a "fresh". 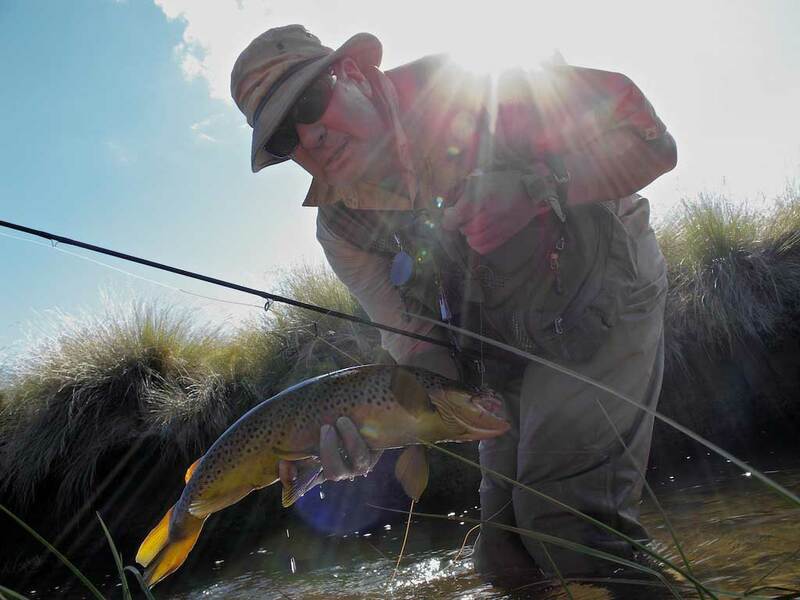 Alan Meyburgh, staff writer for South Africa's Complete Fly Fisherman Magazine, was a recent visitor. 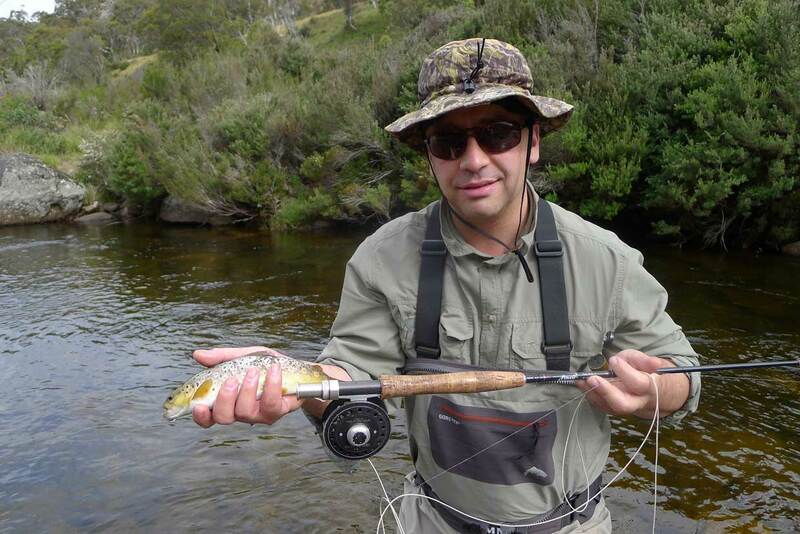 He sampled a variety of our streams, catching plenty of browns and rainbows. 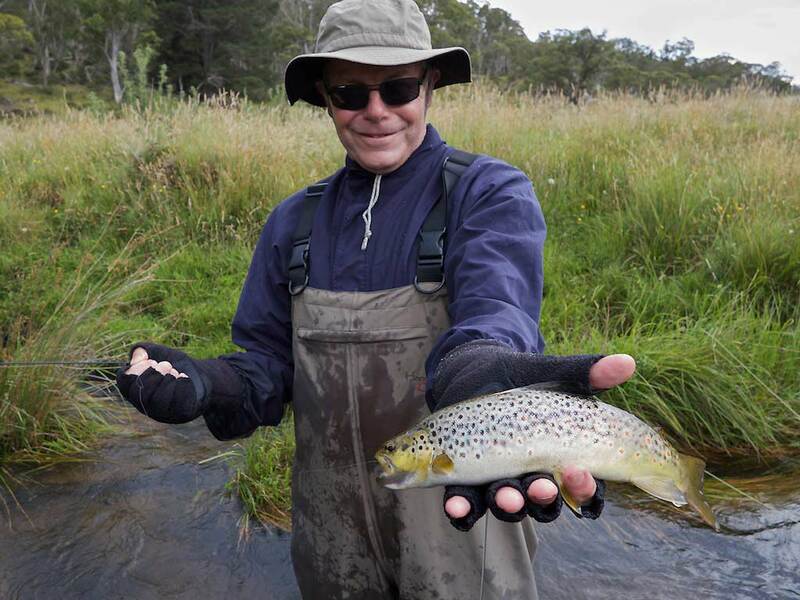 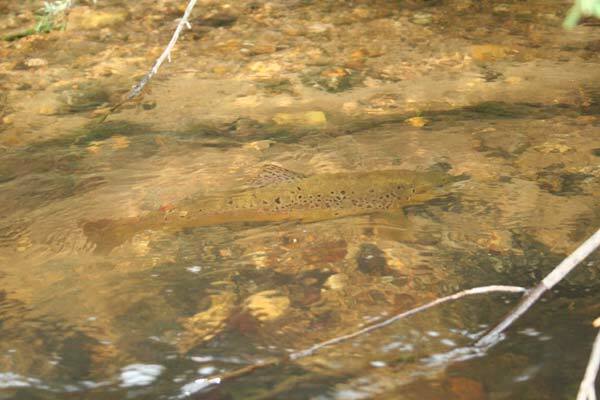 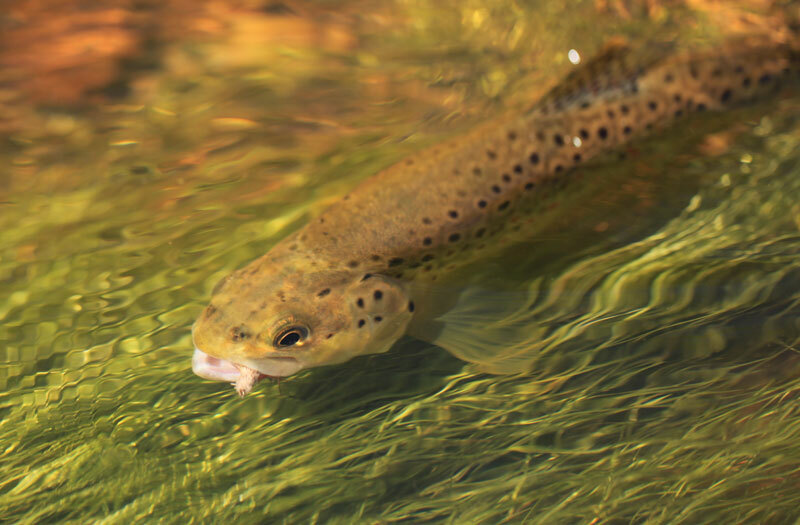 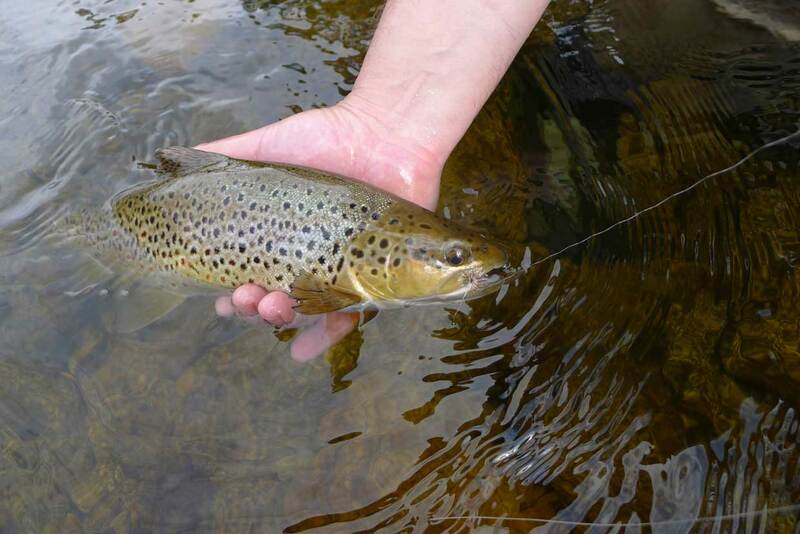 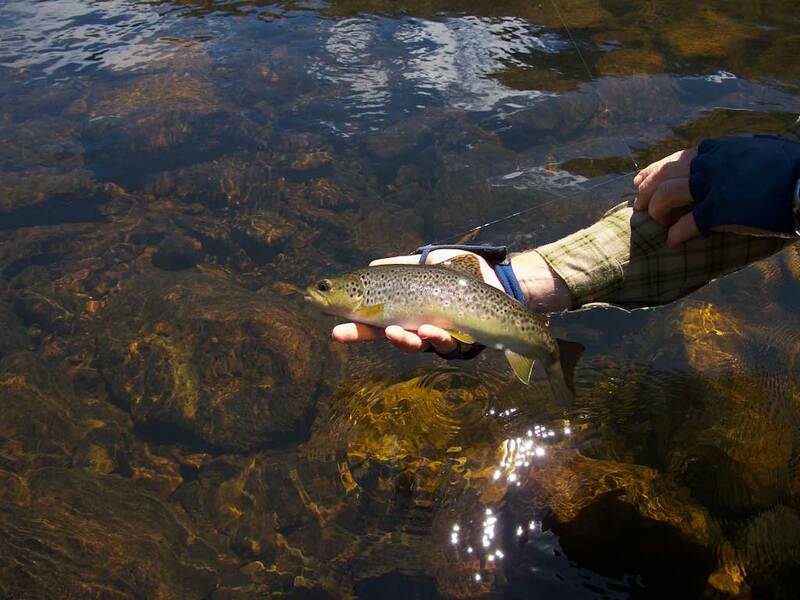 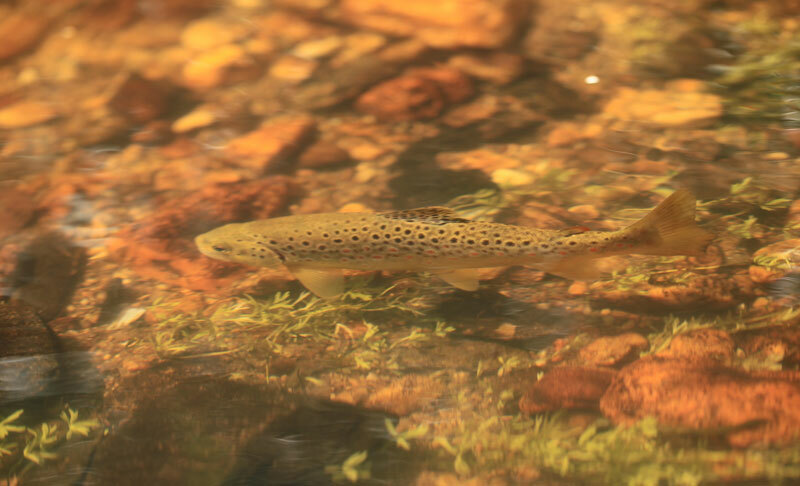 A lovely brown caught and released in a small high country stream. 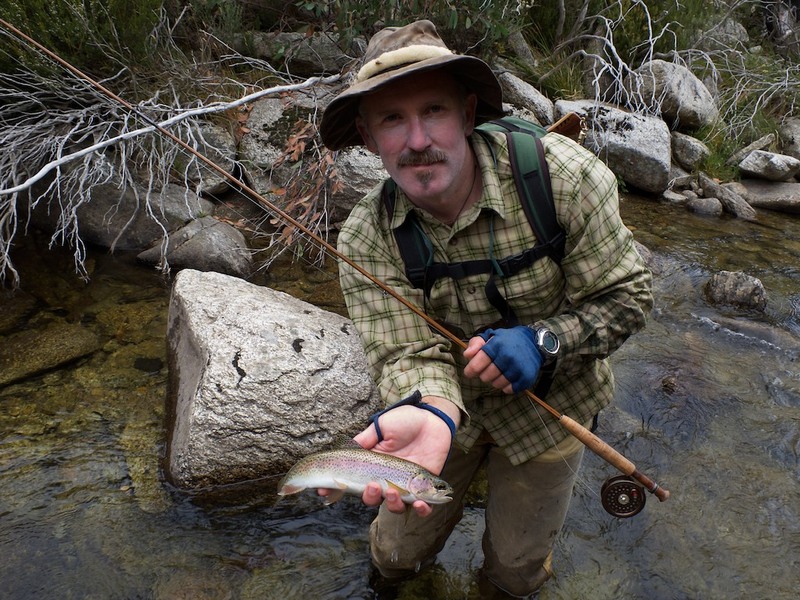 A nice rainbow from Kosciuszko National Park. 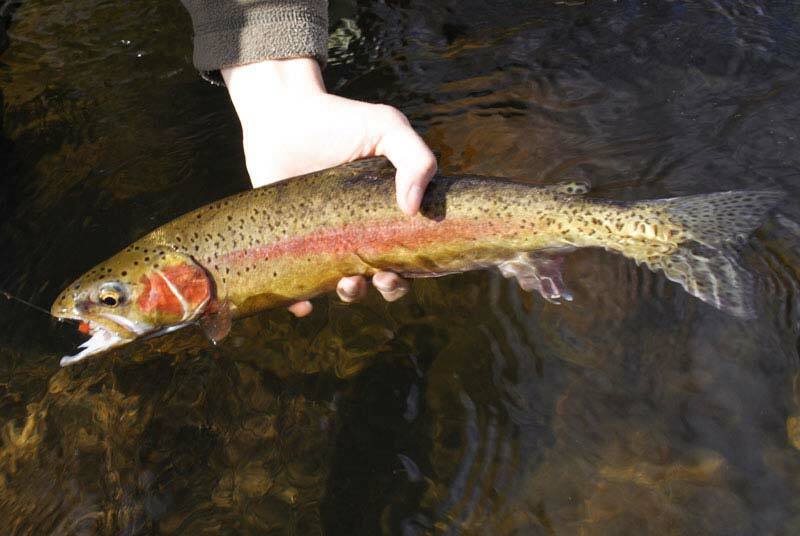 Autumn 08 rainbow from the mountains. 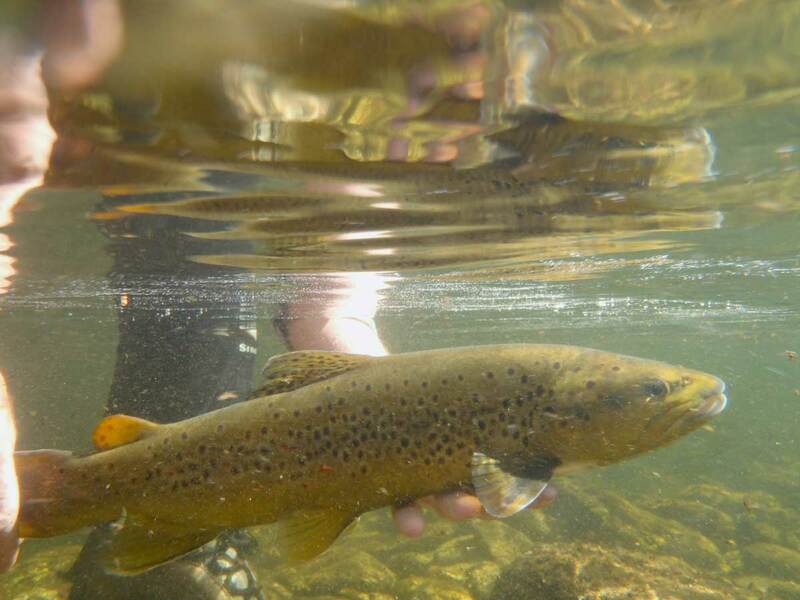 Autumn 08 brown being released. 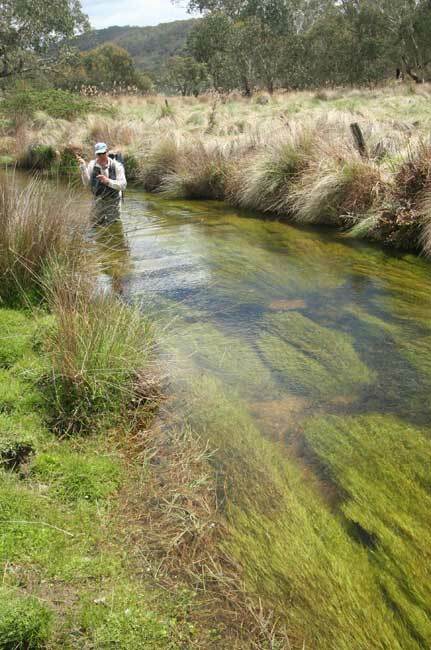 A few days ago I scoped out a section of stream prior to guiding. 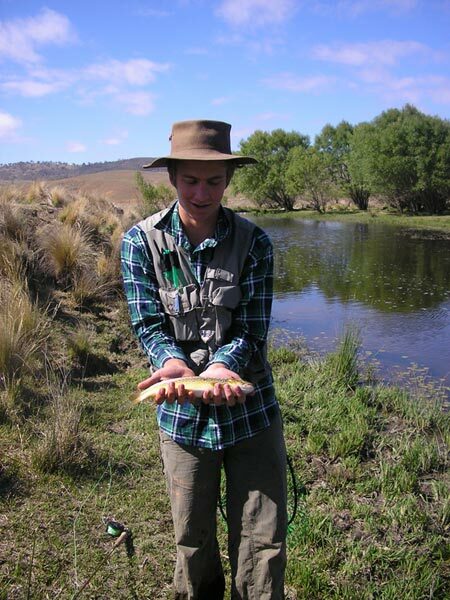 Bamboo rodmaker Nick Taransky came along. 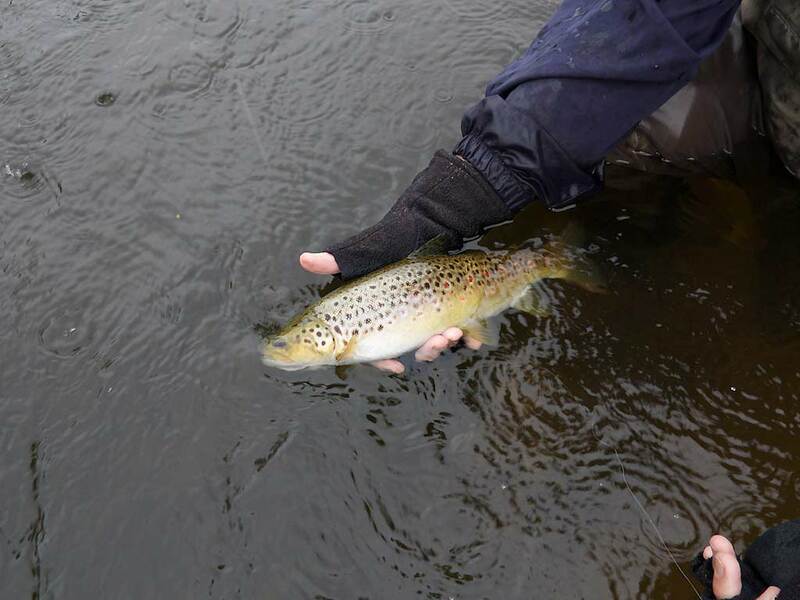 We had some wonderful action on browns to around 4lb, as well as pocket rocket rainbows up to 1 1/2lb. 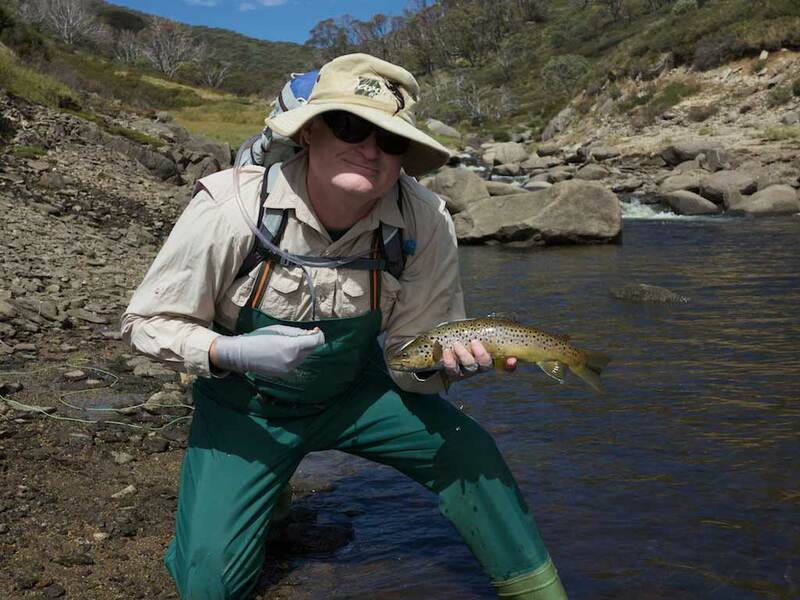 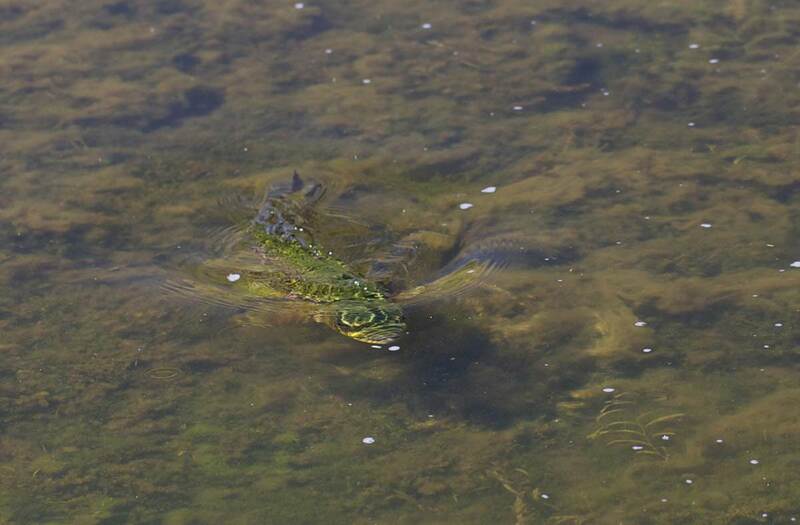 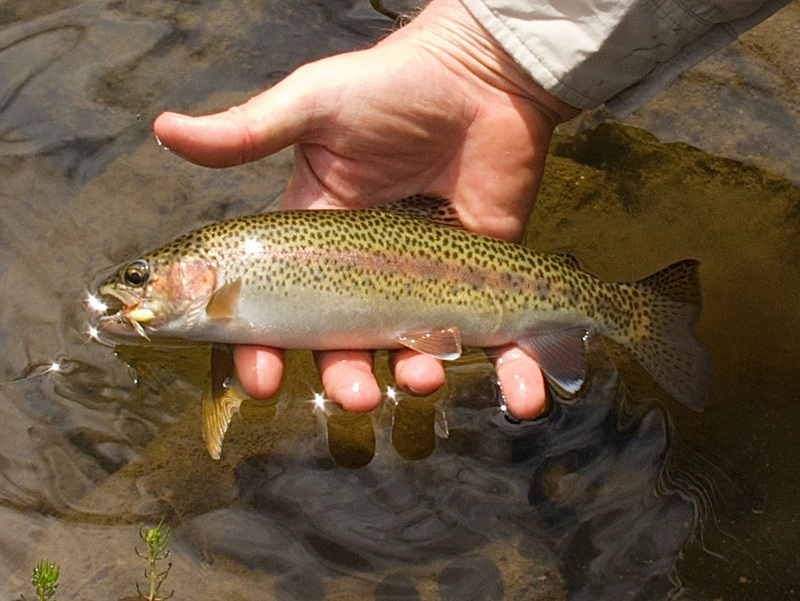 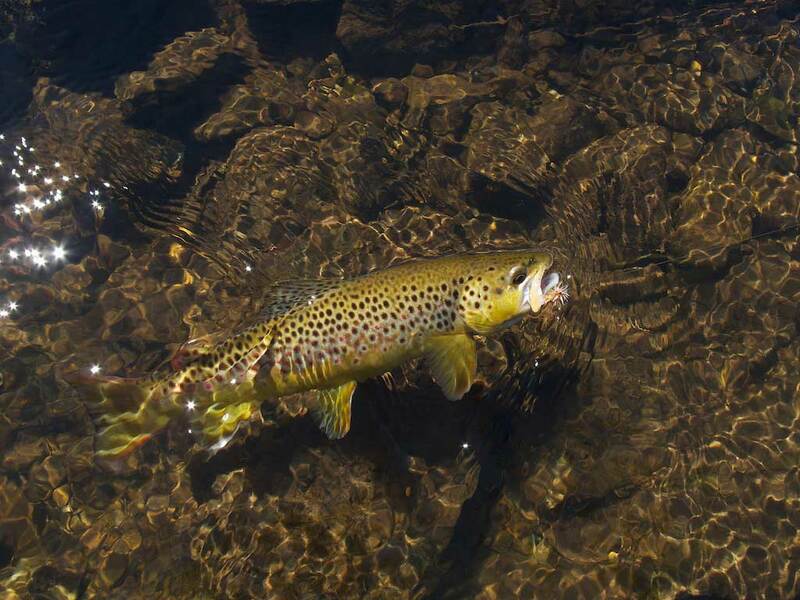 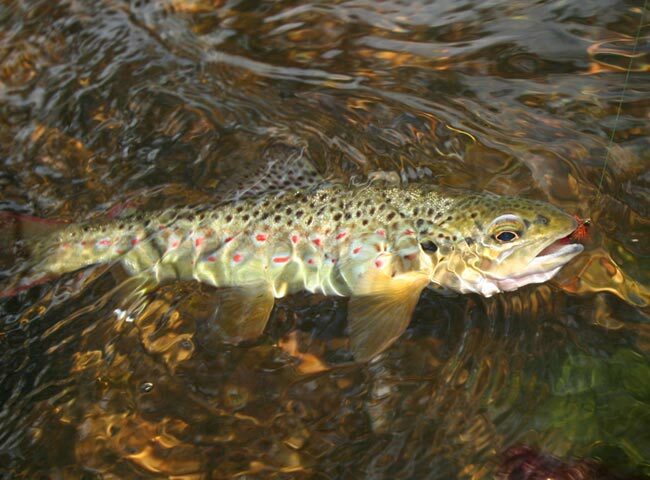 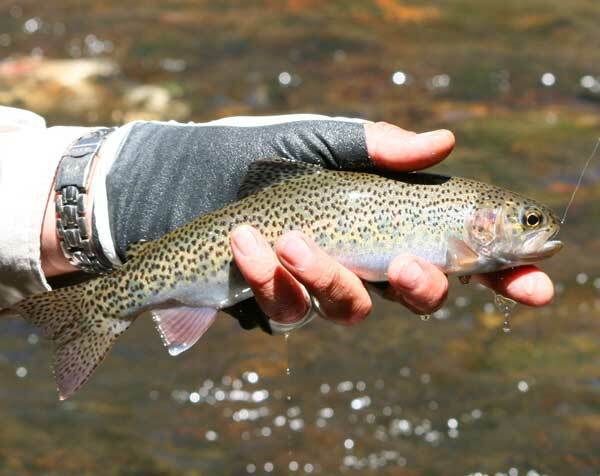 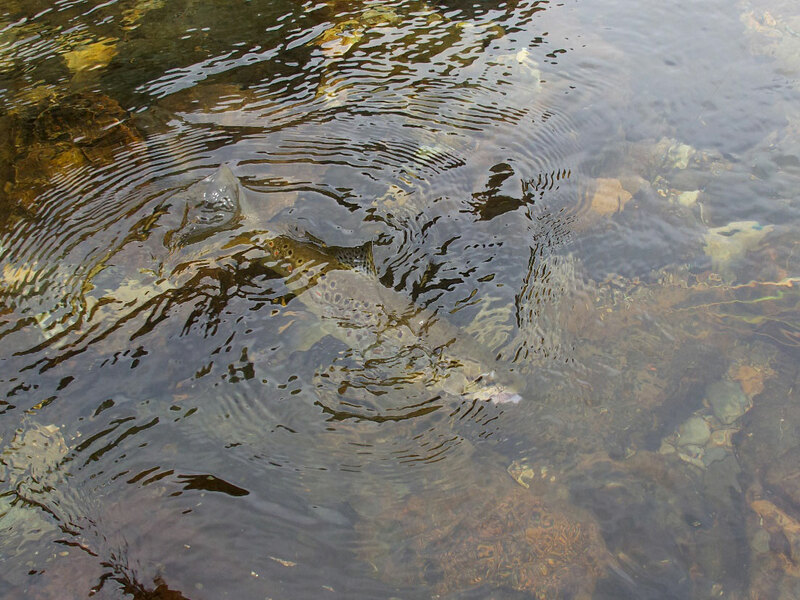 The fish were active on hoppers, which are still around in good numbers in the high country. 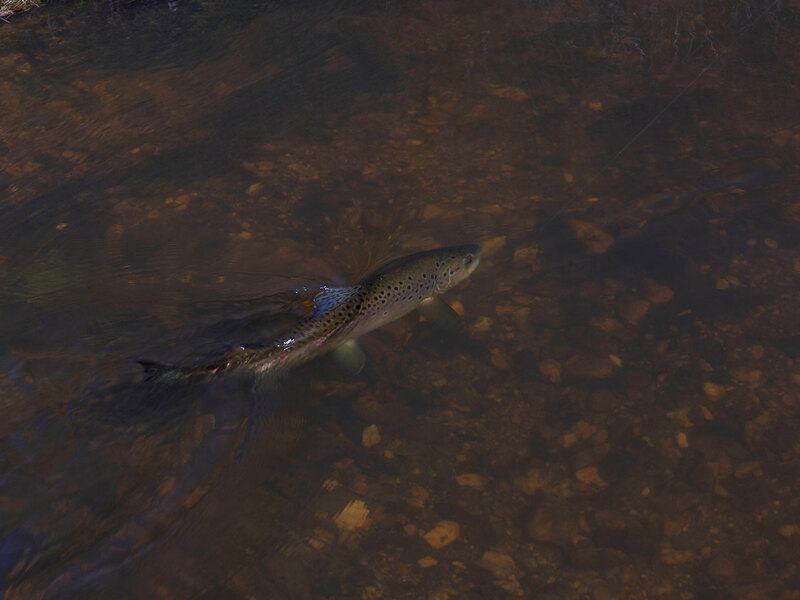 Nick managed to capture a nice action sequence of me catching and releasing a beautiful jack brown. 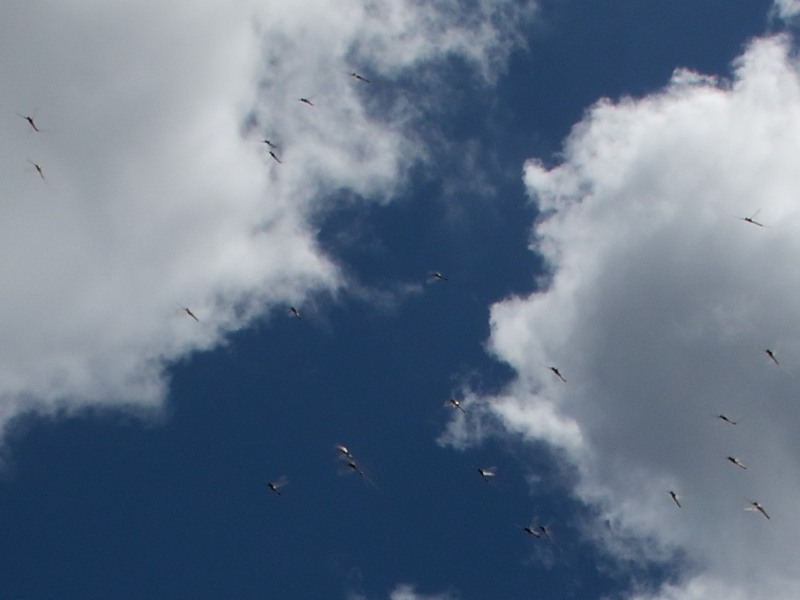 Click on the picture on the left (#4) for a closer look! 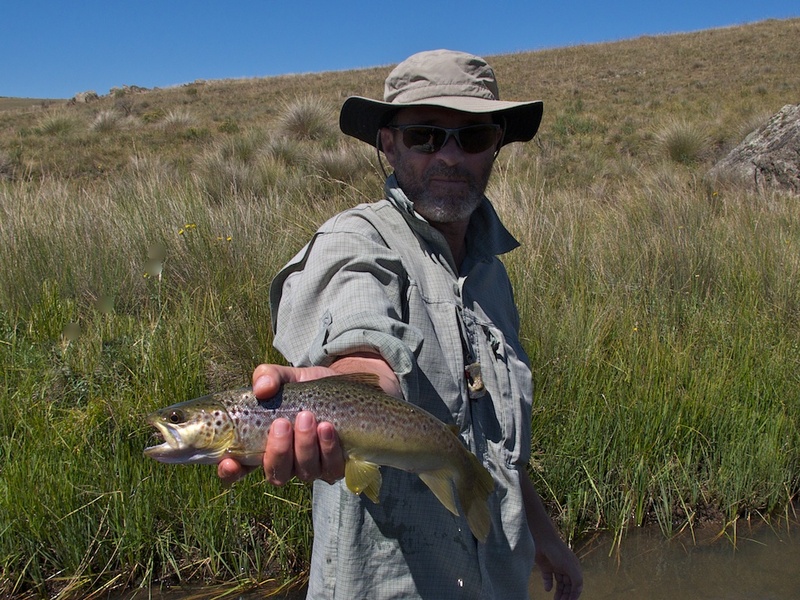 Good rains in the mountains have the streams flowing well, and fish hungry for hoppers! 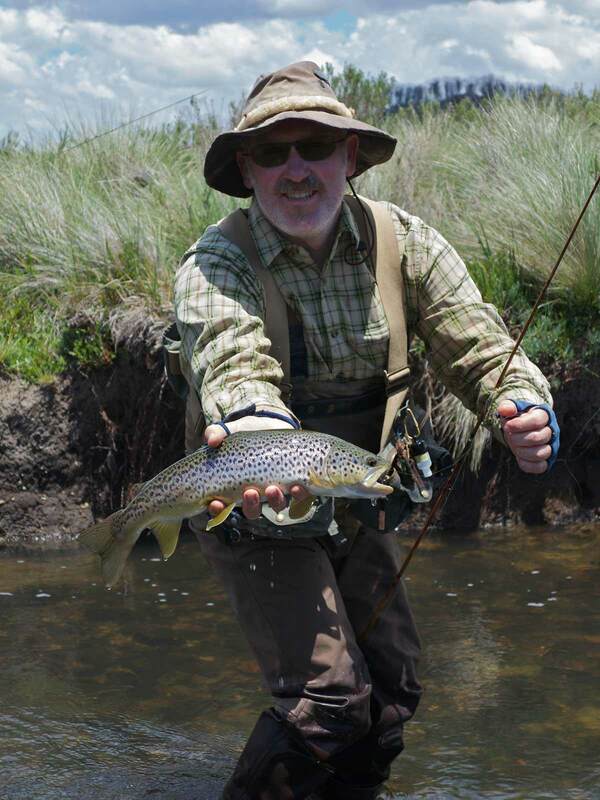 Another happy customer bringing a wild brown to hand. 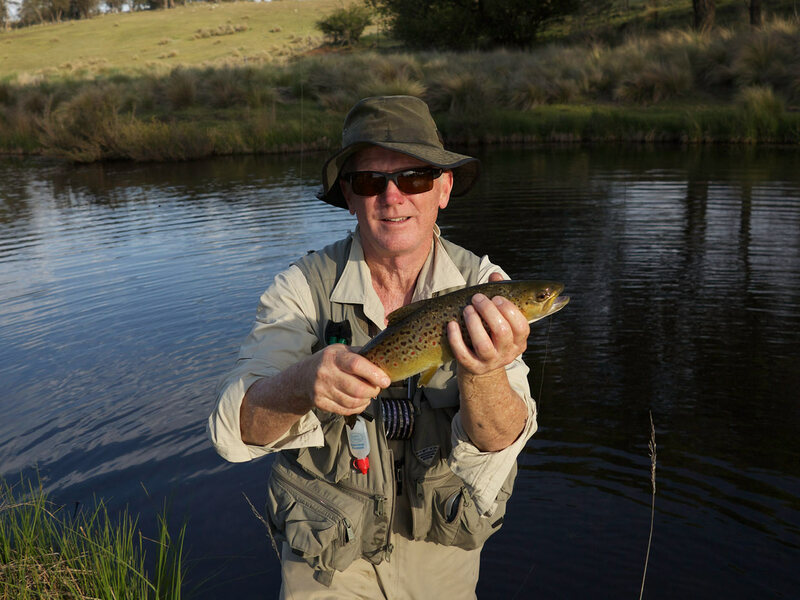 A lovely high country fish. 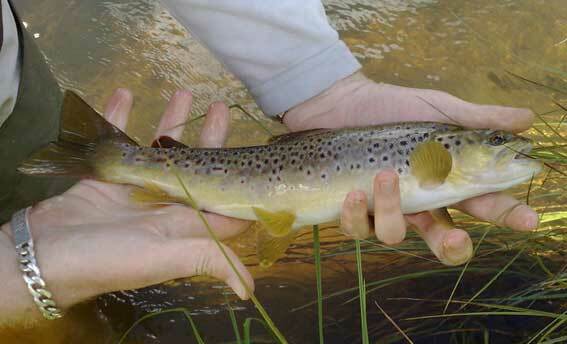 Typical early season brown (October 2007) from the mountains. 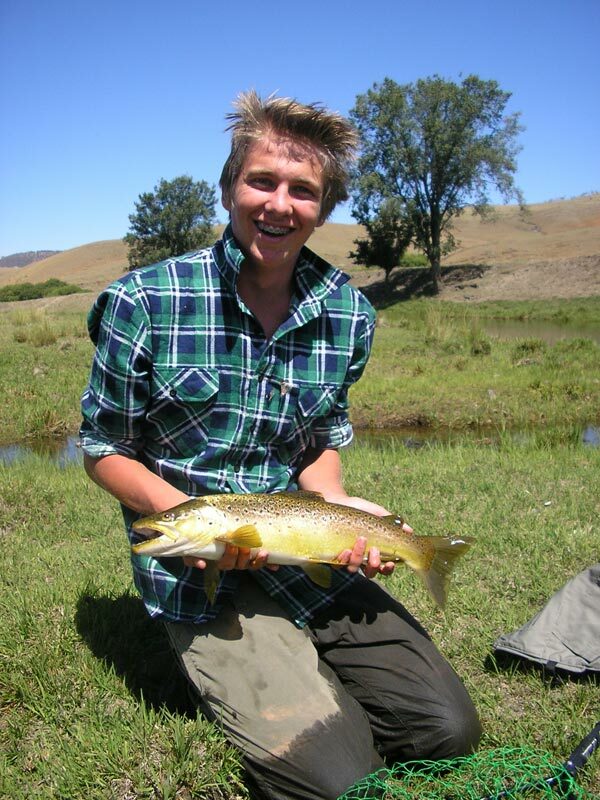 Haydn Jenkins with a wild small stream brown. 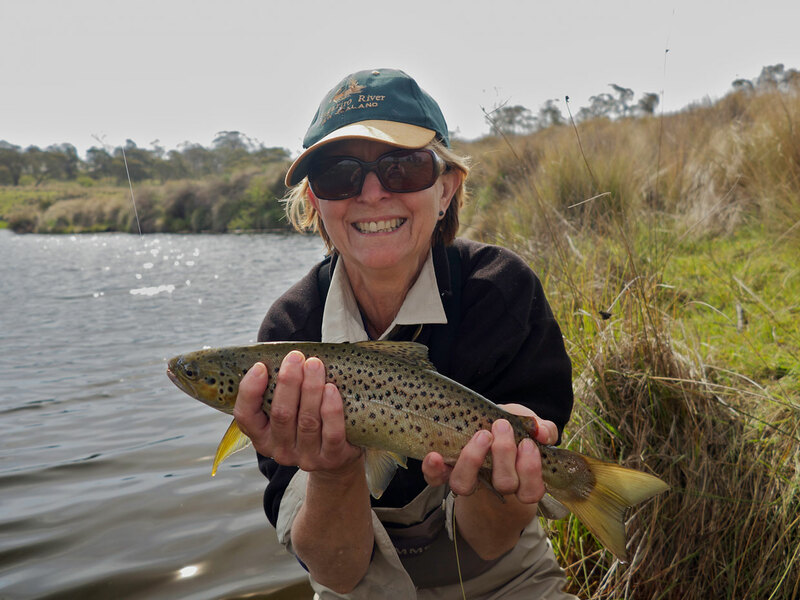 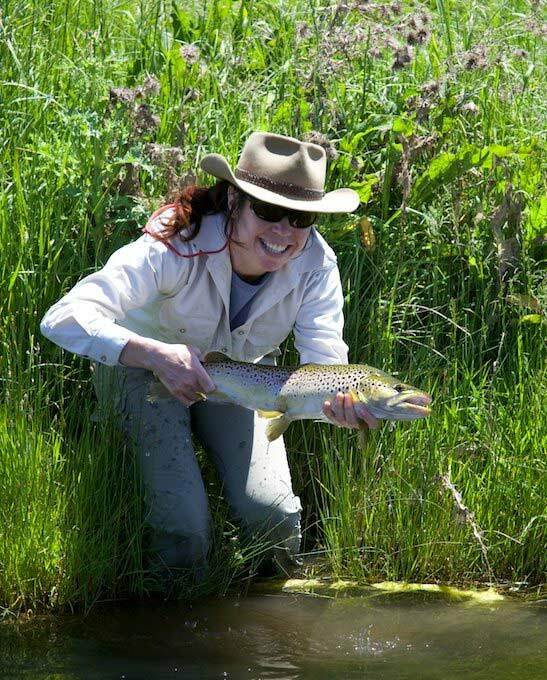 Trish Porter with her first trout on fly! 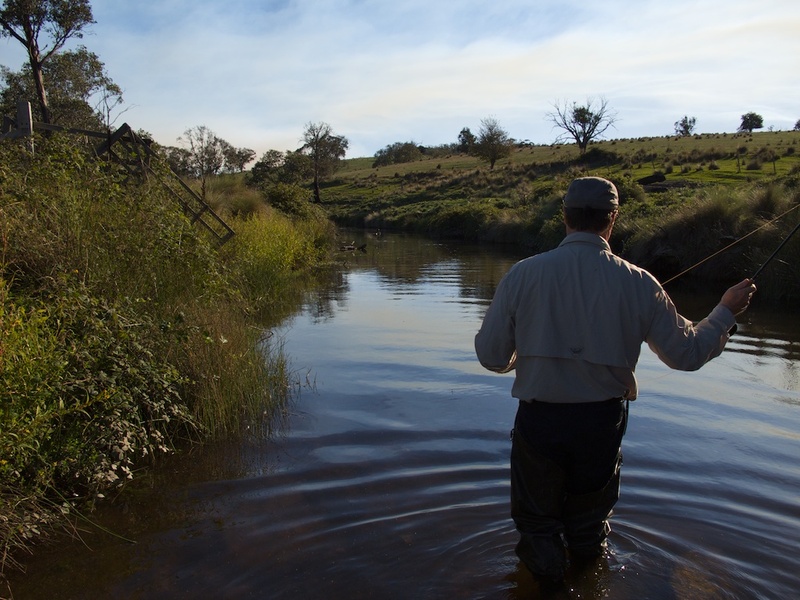 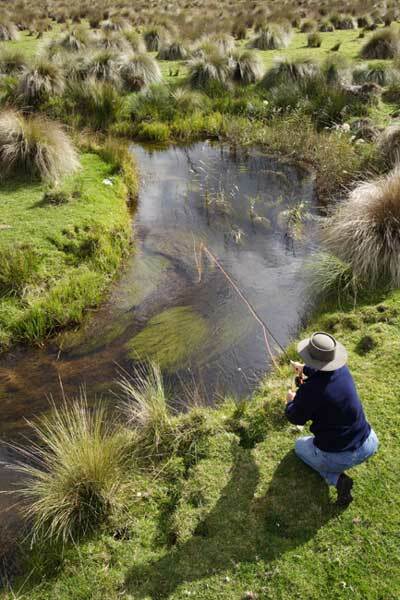 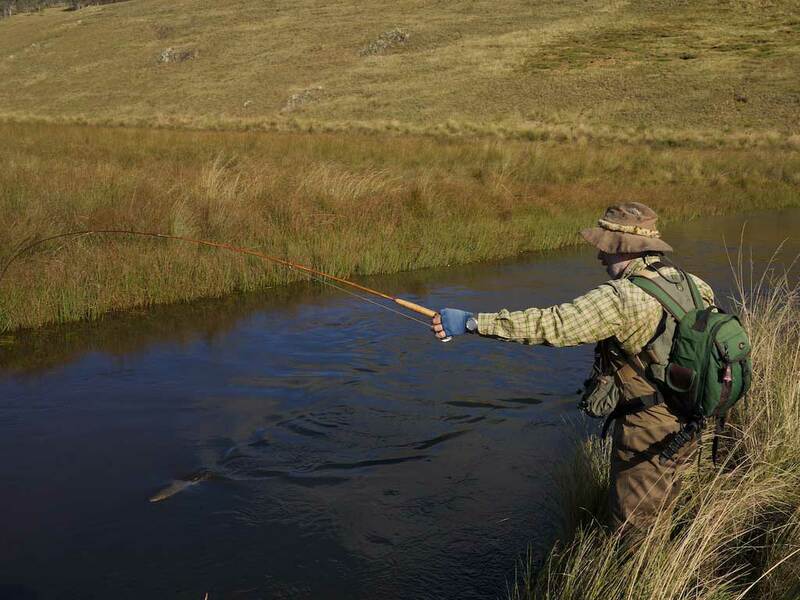 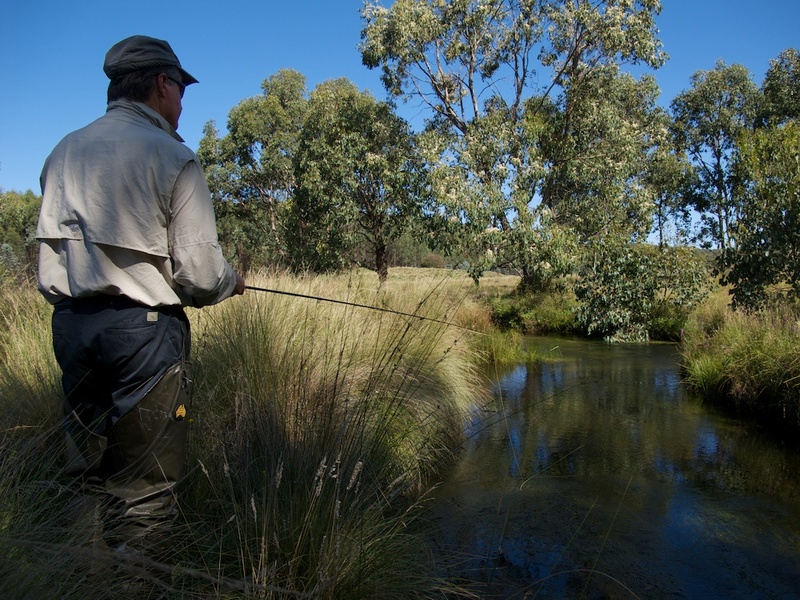 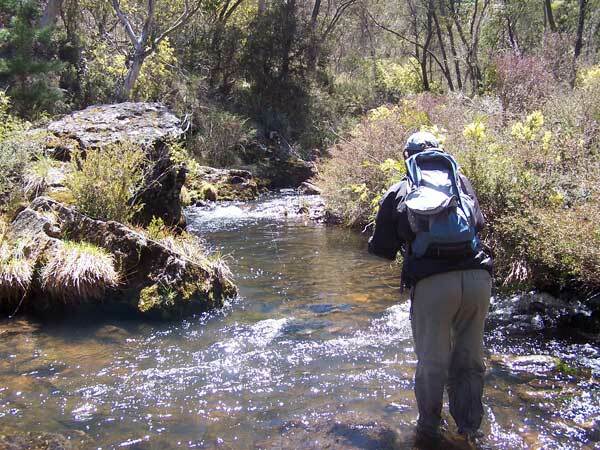 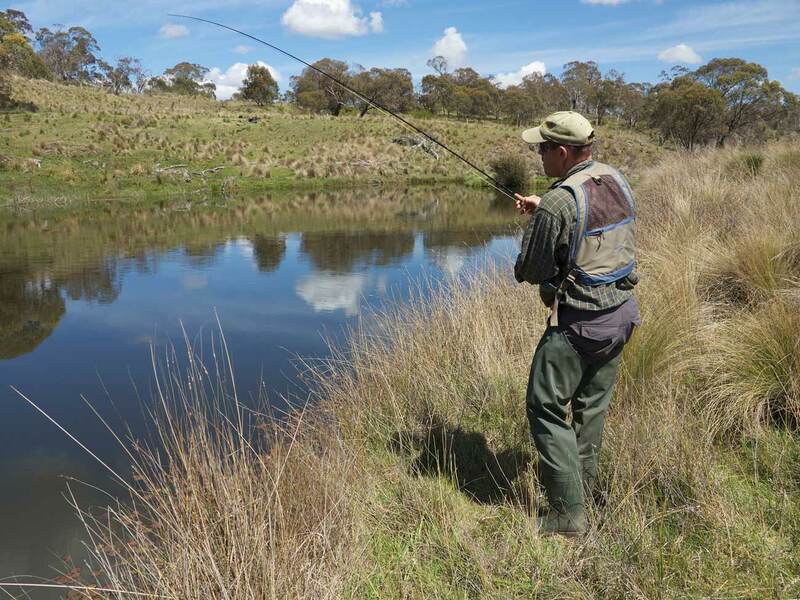 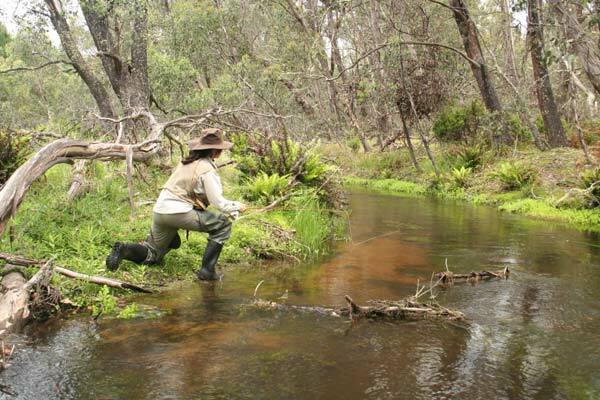 Pip Todd fishes a pool on a lovely Monaro spring creek. 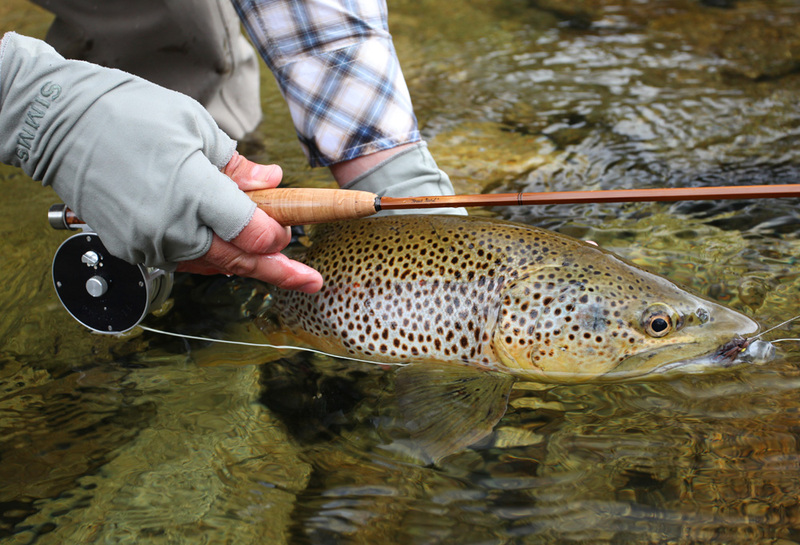 Sight fishing for wild browns like this is the pinnacle of our sport. 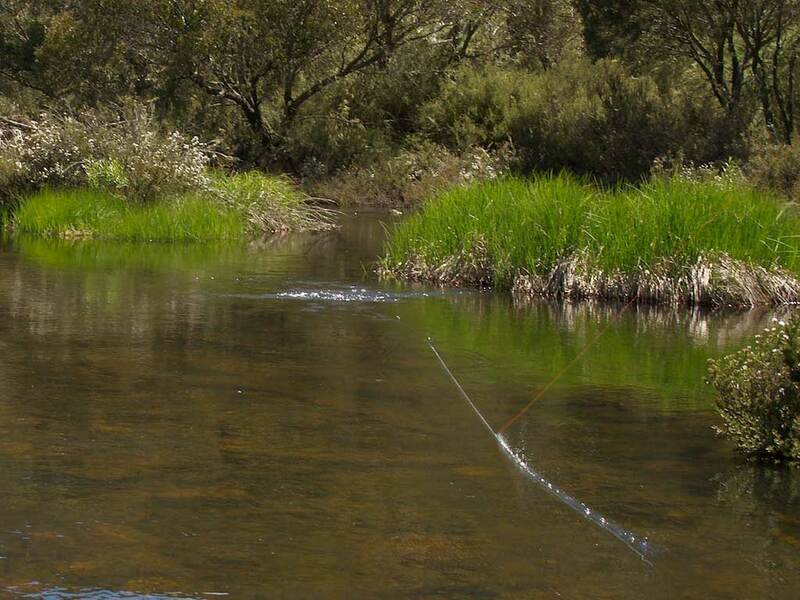 Miri Robinson fishes a run on a local spring creek. 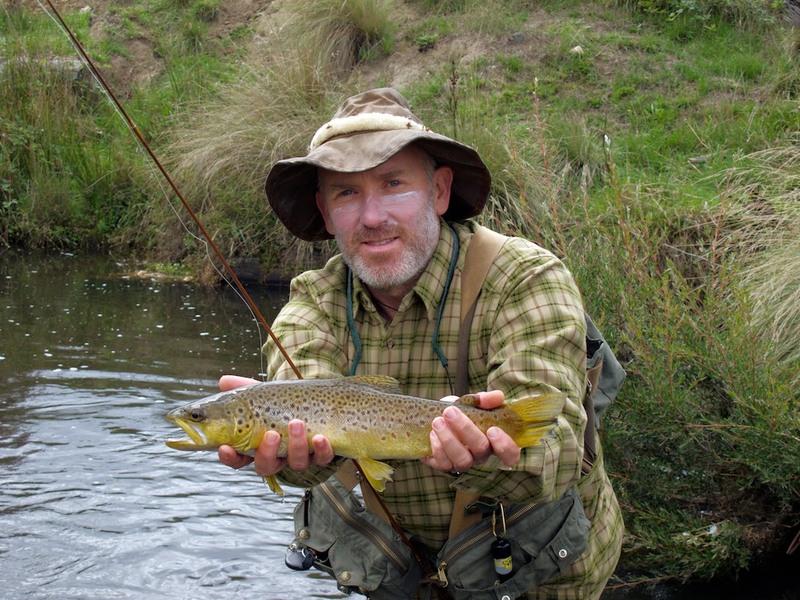 Despite dry conditions in the region, early 2007 has seen some fantastic hopper fishing to browns in wonderful condition. 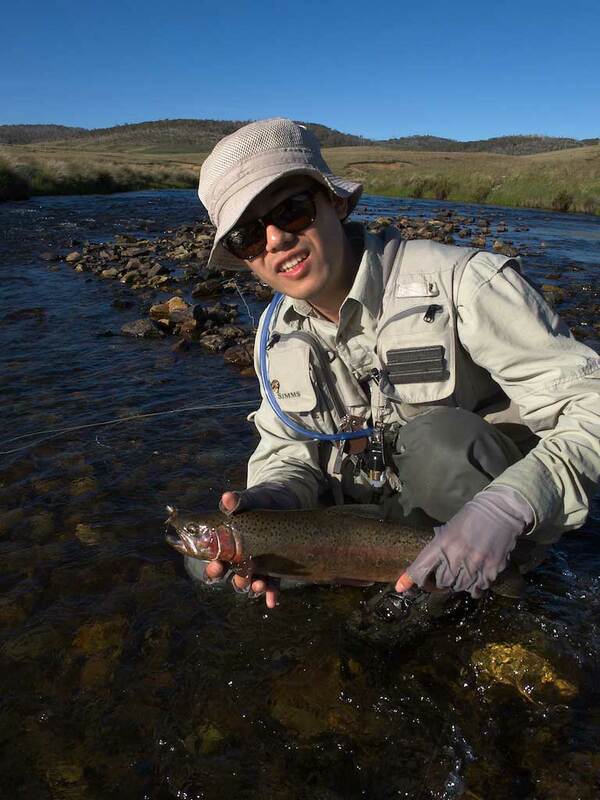 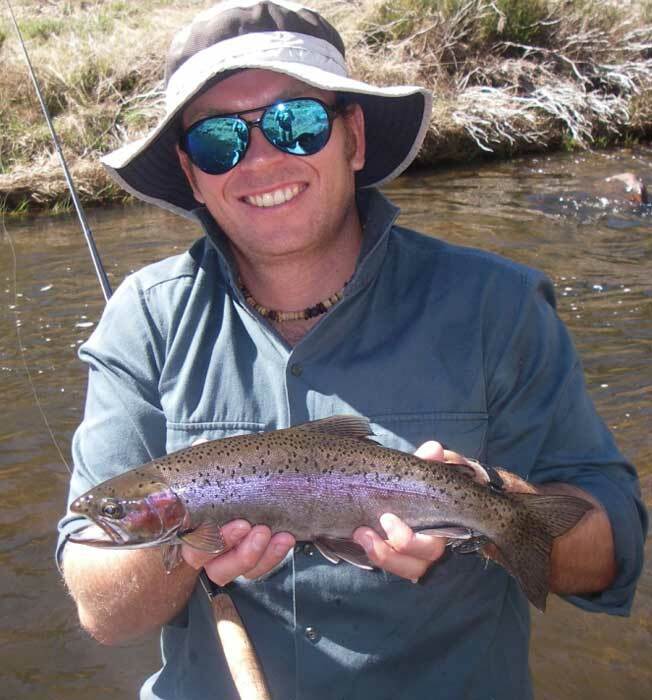 Martin Brennan from North Queensland with one of several rainbows he landed on his trip down to the Snowies. 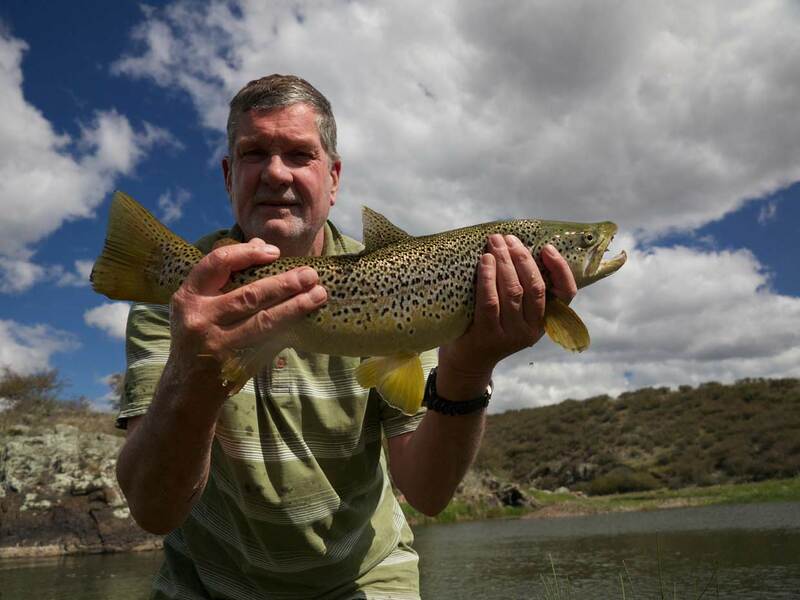 Martin with a brown trout. 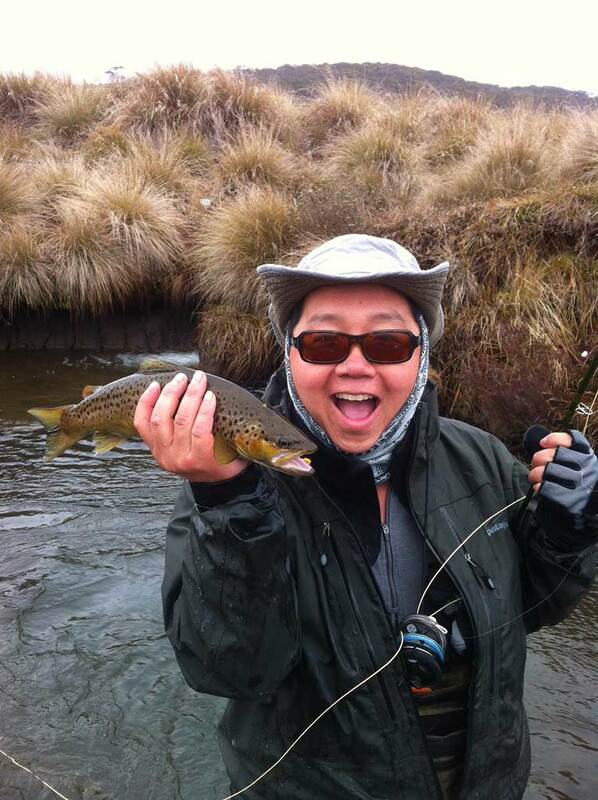 Guides day off! 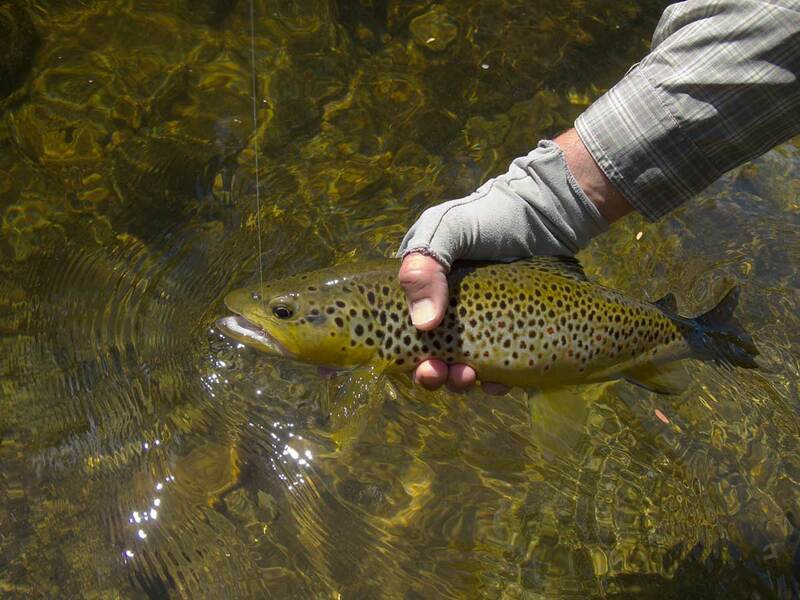 A nice brown from the high country. 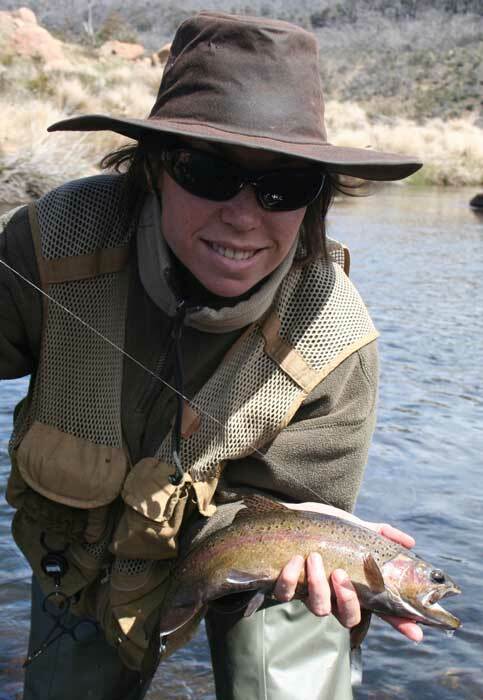 Miri Robinson with a early season rainbow. 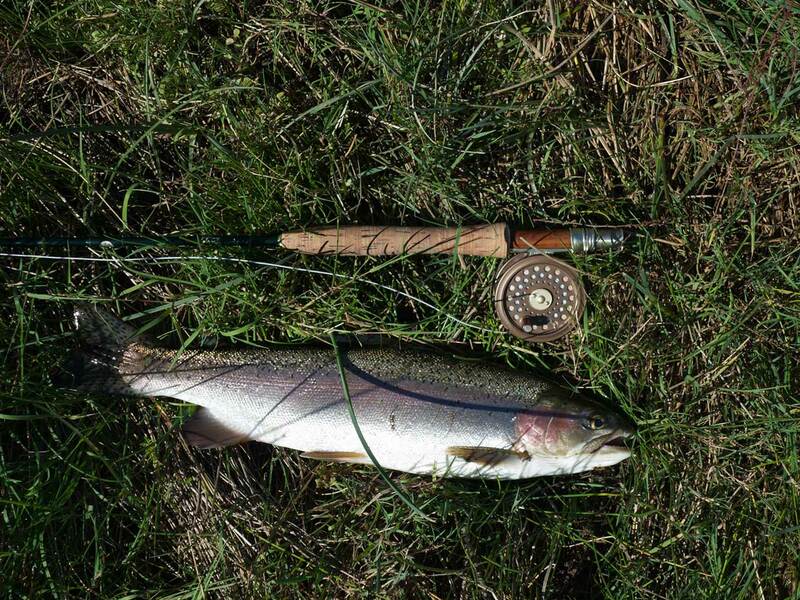 Bamboo rodmaker Nick Taransky with an October Rainbow. 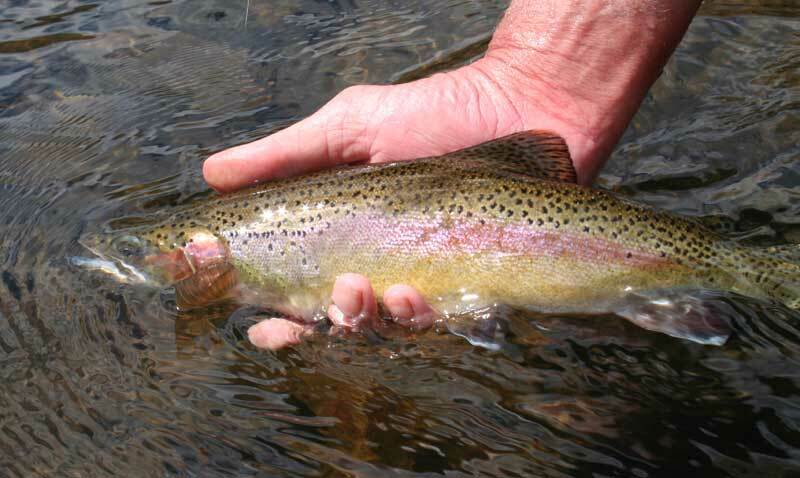 Typical rainbow from the mountains.